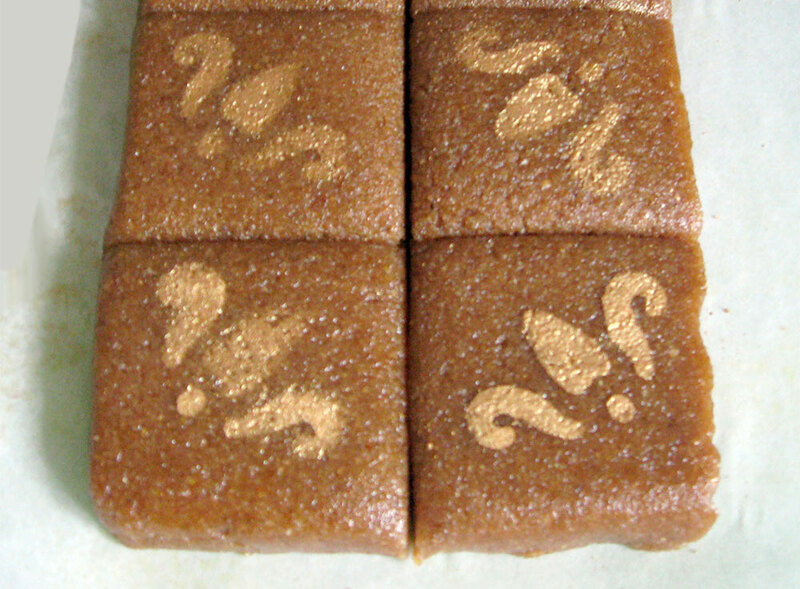 It all begins with gingerbread. I met Helena almost exactly four years ago at the first SCA event I attended after my return to the SCA. Well, at least I know she was there, because honestly the whole event was a bit of a blur for me. The reason I know she was there was because the Baroness of Cynnabar — whom I had also just met — enthused at great length about some amazing “documentably period” gingerbread that Helena had entered in the Arts & Sciences competition and for which she had won a first place. The obvious pride the Baroness displayed for this “Helena” person made me think, “Wow! She must be really talented! I want to do something cool like that one day , too.” It’s the little things that make a big difference. 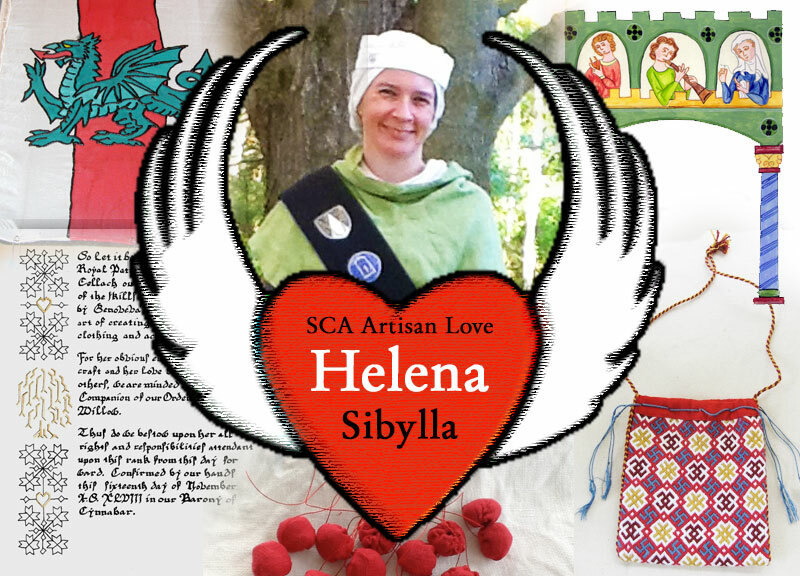 THL Helena Sibylla does indeed make a big difference, for me and for many others her arts and service touch. 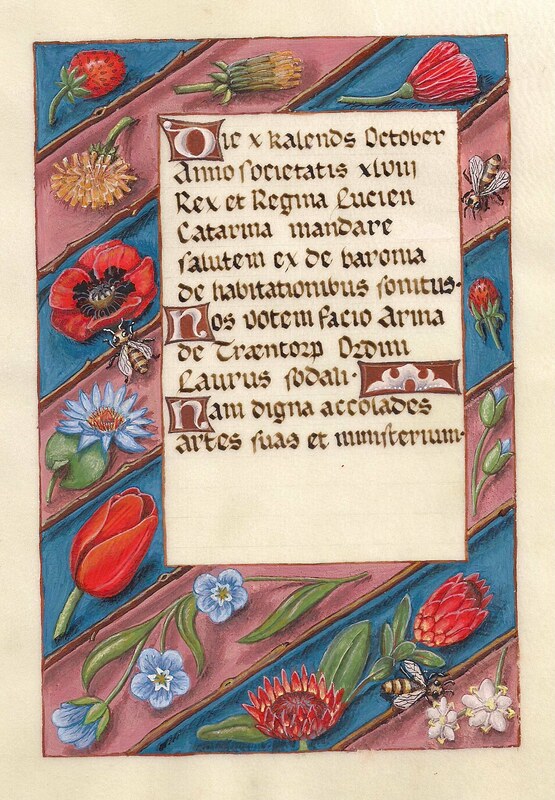 Helena’s interests and talents are varied — most already know of her calligraphy and illumination, and many of us have been the recipients of one of her lovely scrolls (including myself—she made my Willow scroll). She also sews, embroiders, weaves (tablet and inkle), and makes clothing for herself and her husband. She’s also well known for her gorgeous silk banners and her delicious baked treats (gingerbread is just one of the recipes in her book). One of the things I enjoy most about Helena’s art is just how much she makes things for other people. 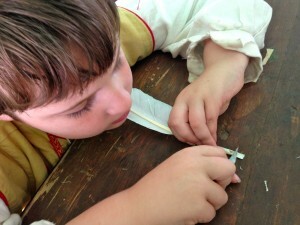 She’s currently working on embroidering the Pennsic 44 favors (as seen elsewhere on my blog) and has already made six herself. 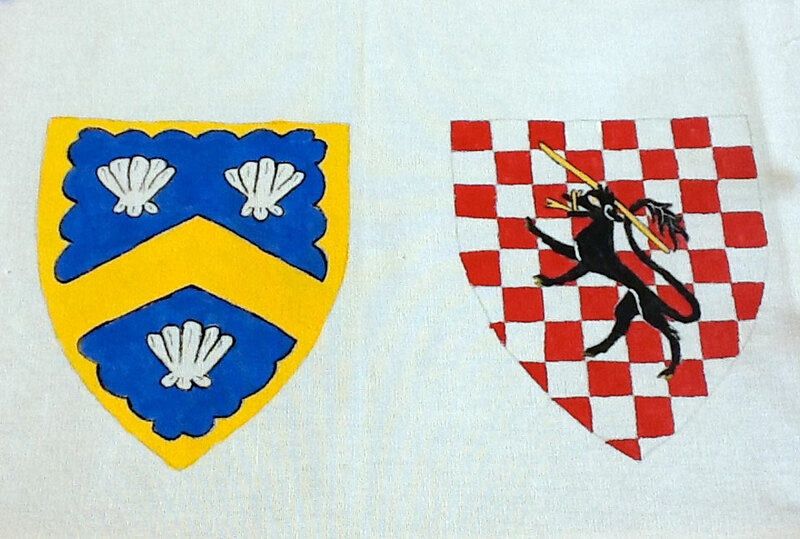 She paints banners for several baronies and creates heraldic patches for the Order of the Rose cloak. 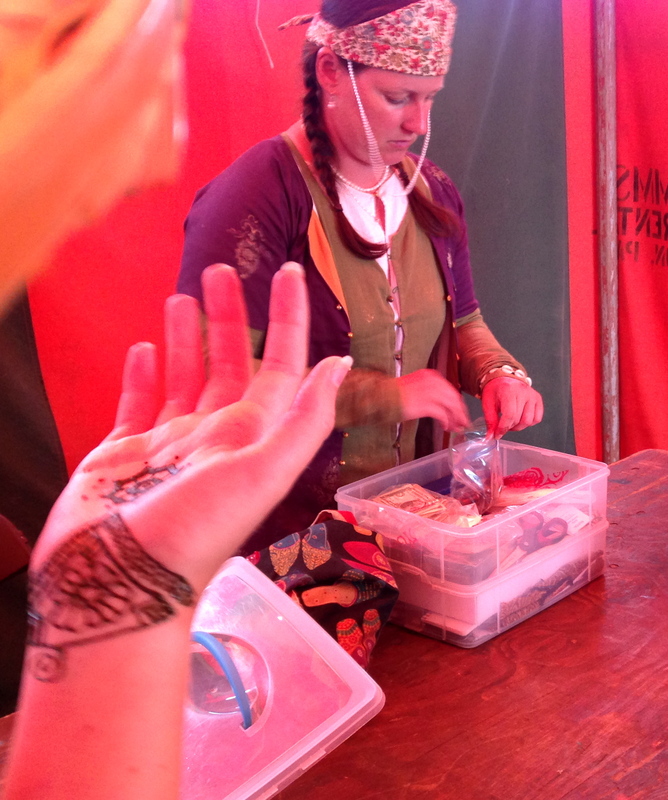 She bakes treats and makes largesse and creates all those scrolls. She just generally gives away much of her art. I commend her highly for her generosity and we are all so much better for it! Helena has created many wonderful artifacts, so when I asked her to choose her favorite, it was a tough question to answer. 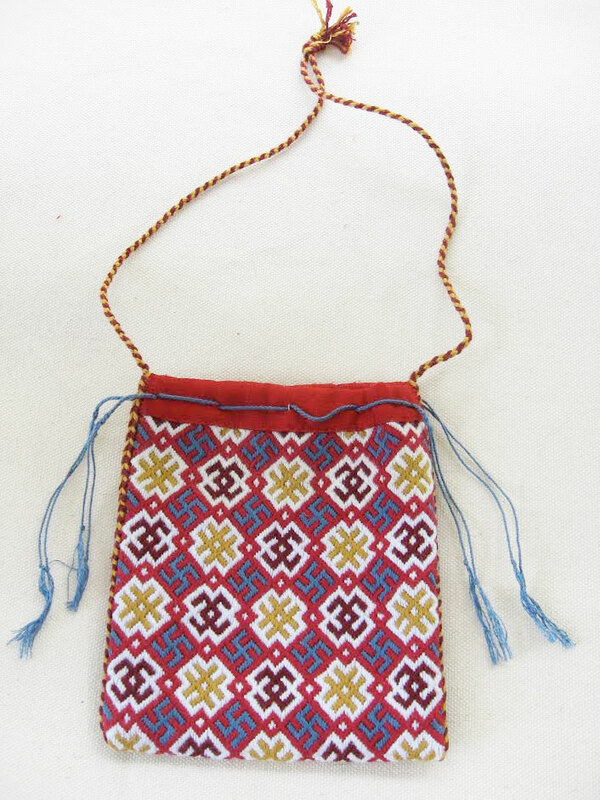 Eventually she settled on her 14th century embroidered pouch she made for the Arts & Sciences Competition in A.S. 46 (2012). 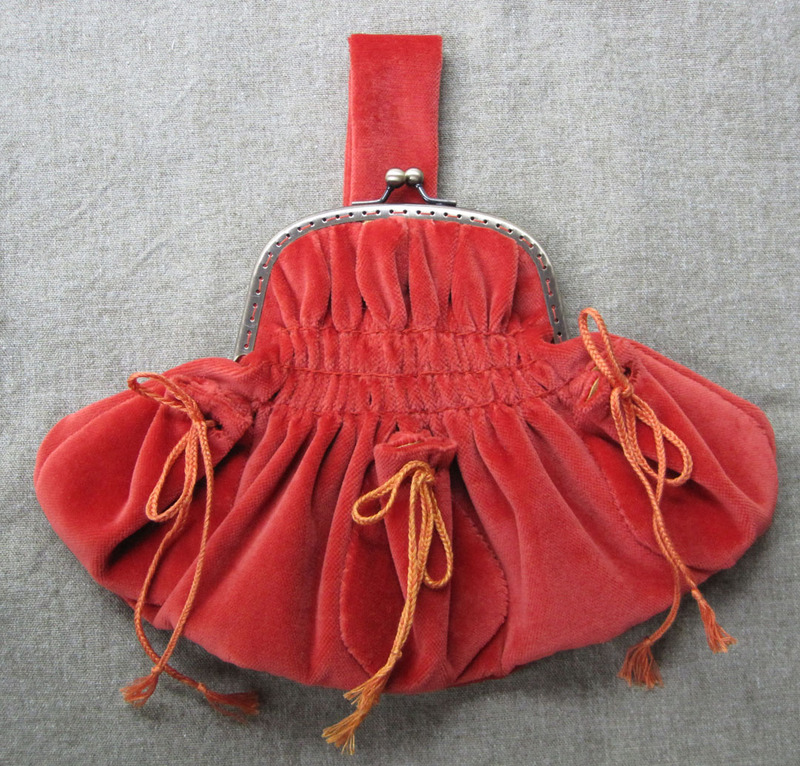 She explained, “This was my first entirely hand-sewn item and I’m really satisfied with the way it turned out.” I remember this pouch well, as it was in the same competition in which I entered my first two entries and I was quite in awe of it. 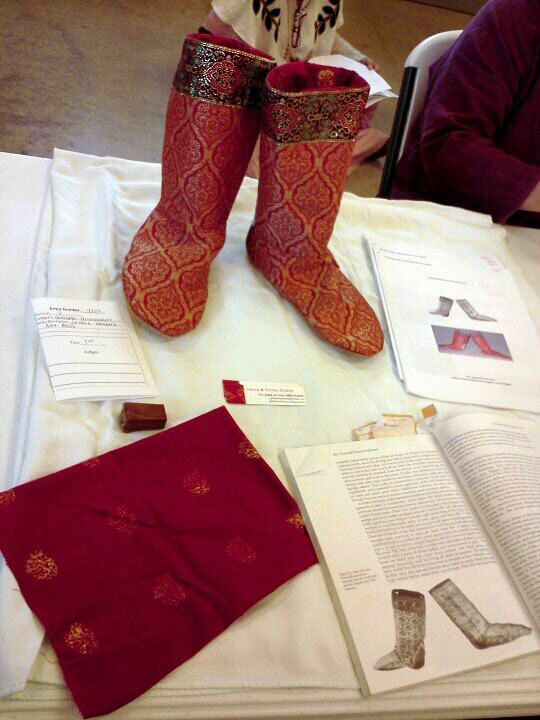 She is no stranger to the A&S competitions, having entered and received excellent scores several times. Of late, she has been judging more often than entering, but I have hopes she will take on the challenge of a Pentathlon in the coming years. 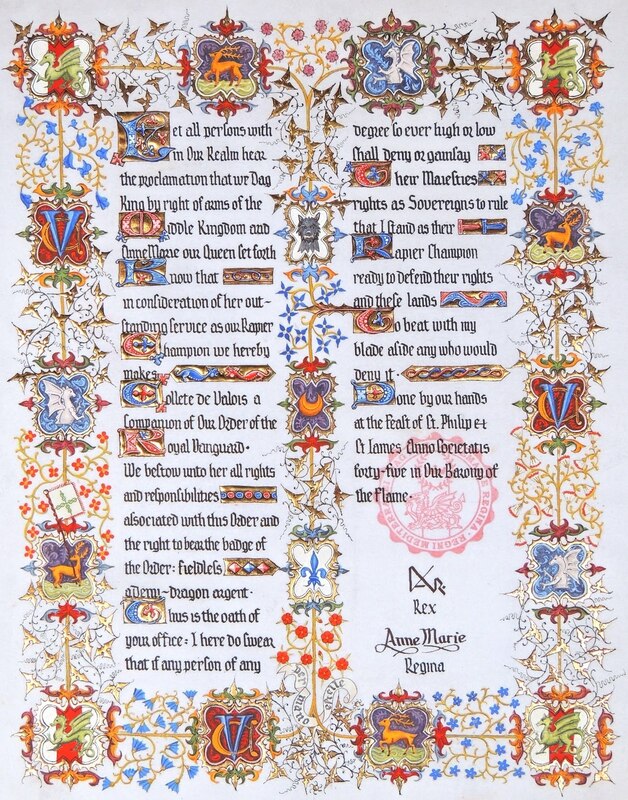 And it should come as no surprise to hear that Helena has been honored as the Barony of Andelcrag’s Baronial Arts and Sciences Champion. 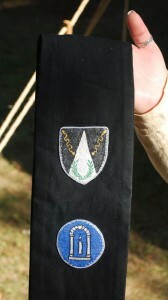 She is also a member of the Order of the Evergreen. 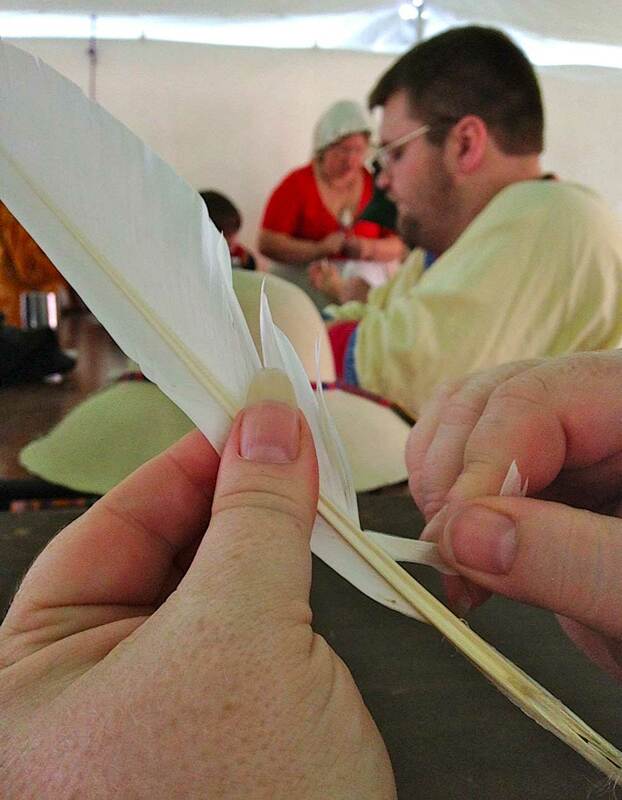 While Helena is not apprenticed to a Laurel, she is a protége to Master Straum von Bairzog — he and his lady, Baroness Ute von Munchen, are well aware of her varied interests in the Arts & Sciences. In the Quest she received from Master Straum, she has been charged with learning a new skill and teaching it to others. I’m looking forward to what she might be able to teach us next! Be sure to keep an eye on her blog, http://partifleur.wordpress.com, for news on her upcoming projects. This is also where you’ll find many photos and reports on past projects, including the recipe for the infamous gingerbread. Helena will be teaching her Introduction to Brick Stitch Embroidery class at Andelcrag Althing this weekend. 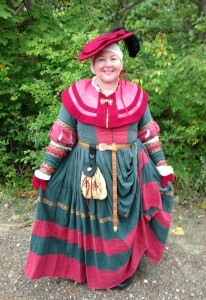 She will also likely be teaching at least one class at Pennsic this year, probably the Self-Stuffed Button-Making class. 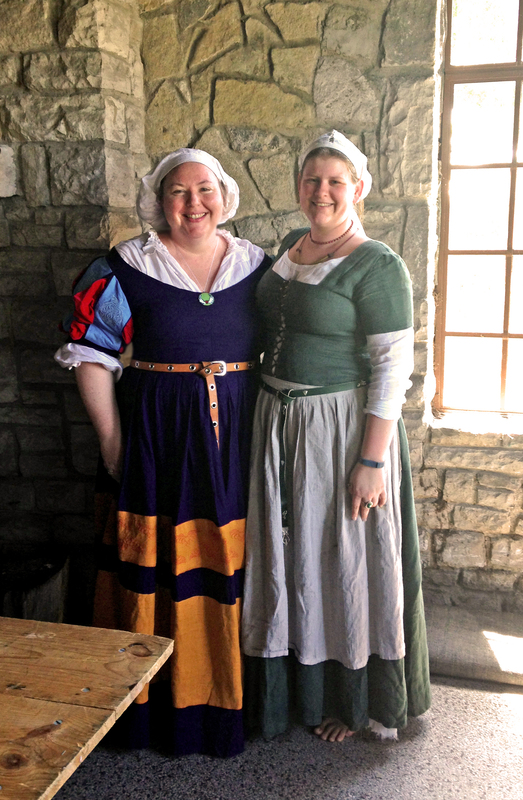 If you can’t make it to her Pennsic class, however, she’s kindly provided us with a tutorial on how to make these historically accurate buttons! 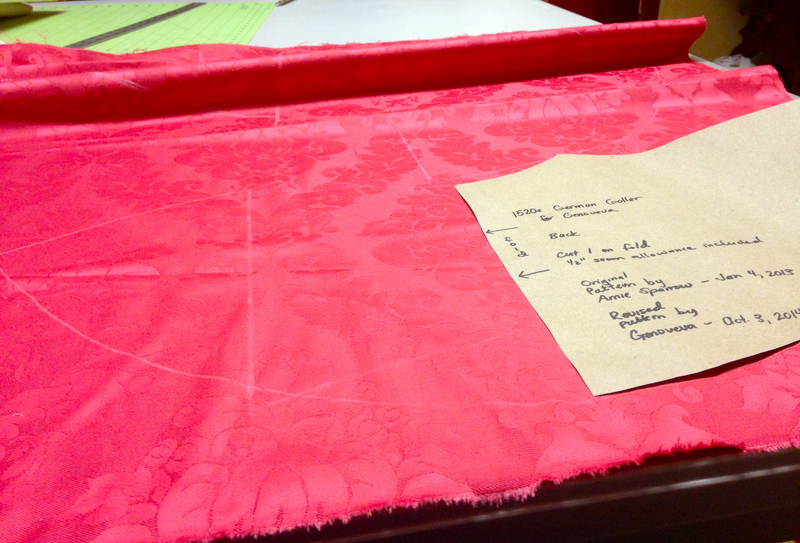 The steps for making a self-stuffed cloth button are simple, but the process does require some dexterity. You should be able to do some very basic hand sewing with needle and thread. 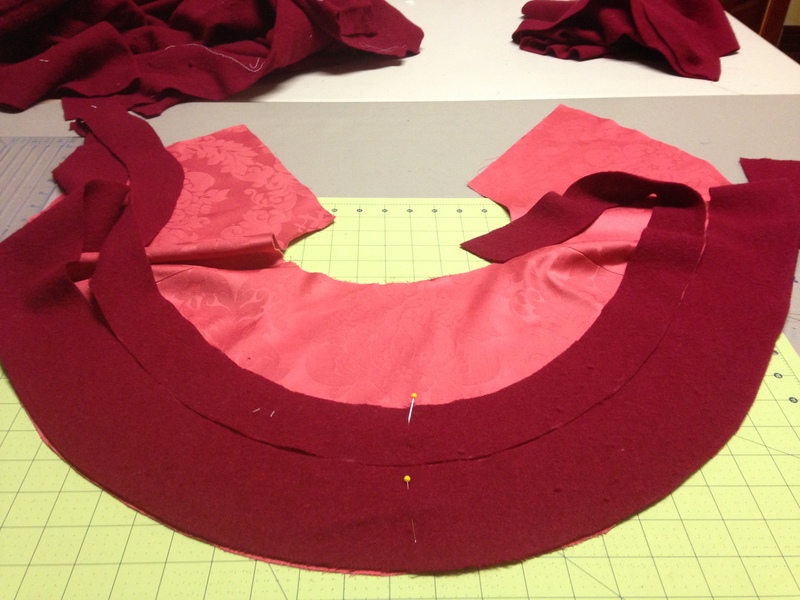 Step 1 – Cut Fabric Circles. 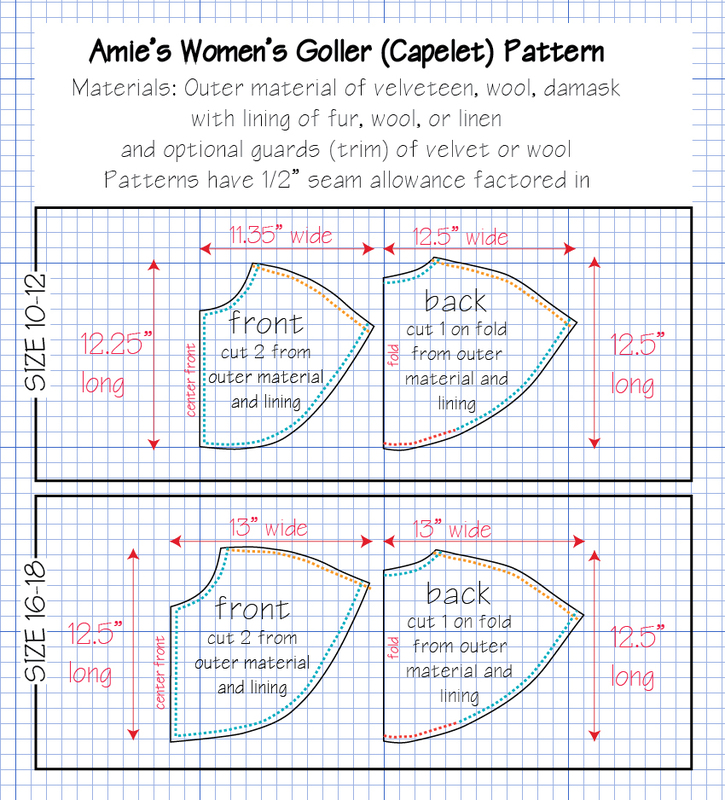 You will need to experiment with the fabric you want to use to see what size circles are needed to make the finished size button you want. Thinner fabrics will crush more and require a larger circle to make a bigger button, while heavier fabrics like wool or corduroy will crush less so you can start with a smaller circle. Use whatever you like to make circles the right size. 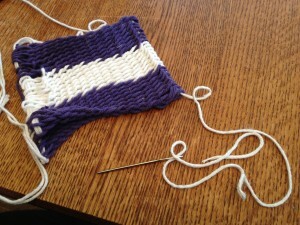 Step 2 – Stitch Around. With a needle and thread, make a running stitch around the circle of fabric about one-third of the way in from the edge. 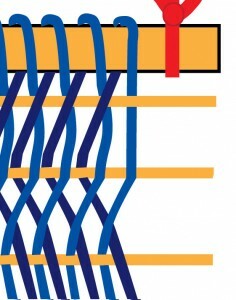 Use a thread heavier than regular sewing thread – you want something that won’t break when you pull firmly. There are several varieties of heavyweight or button thread available. The Gutermann brand makes a heavyweight thread that comes in a wide variety of colors so you can coordinate with your fabric. 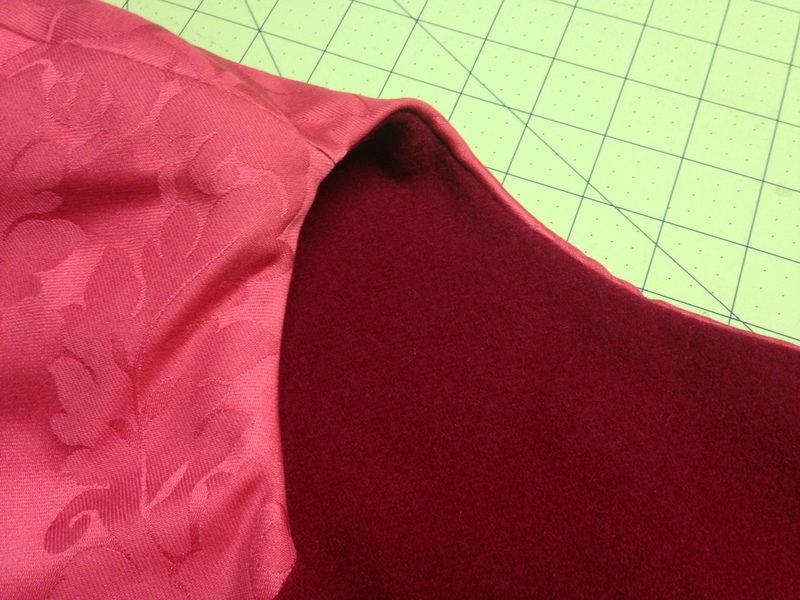 Finish so that the needle is on what will be the right side of the fabric. Step 3 – Draw It Up. 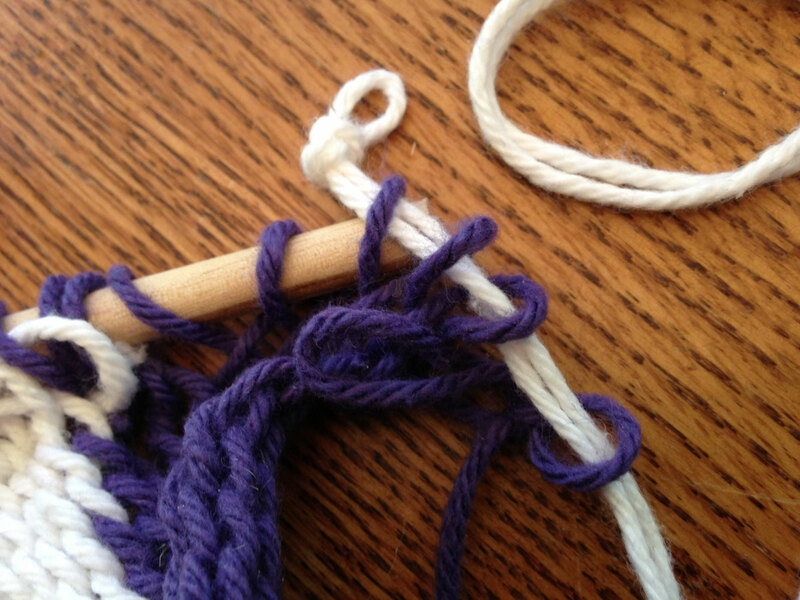 Use the thread to pull in the edges of the circle – make a little drawstring hat for your finger! Pull carefully so you don’t drag the knot through the fabric as you go. 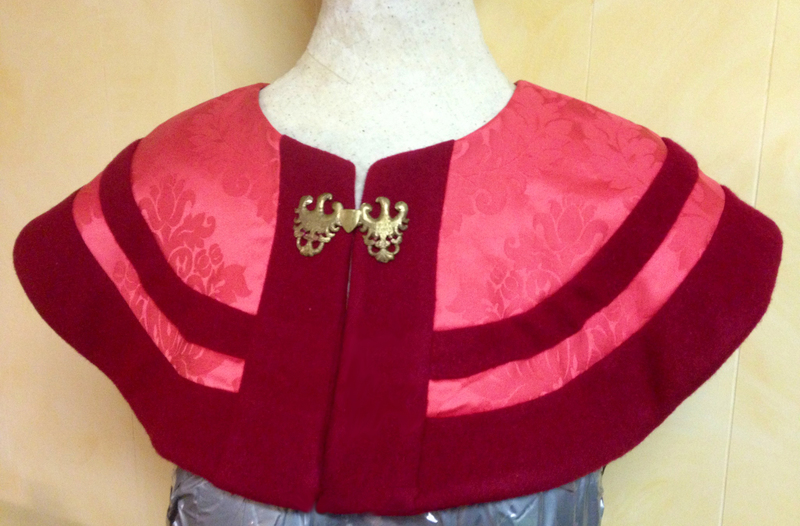 Work the fabric around as you’re pulling so the gathers are roughly even. This doesn’t have to be perfect – you’ll be able to even things out in a later step. Step 4 – Tuck It In. 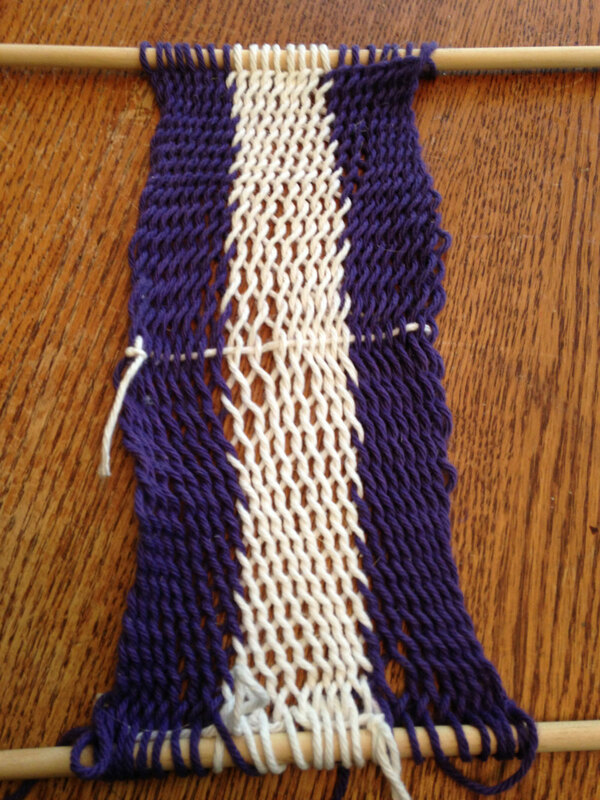 Flip the gathered circle over, keeping slight tension on the thread so the gathering doesn’t come undone. Pull gently on the thread and at the same time, start tucking the raw edges of the circle into the gathered center, working all the way around as you go. This is what creates the stuffing for the button. 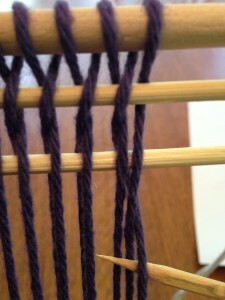 As you work, keep tension on the thread to help the edges stay tucked. 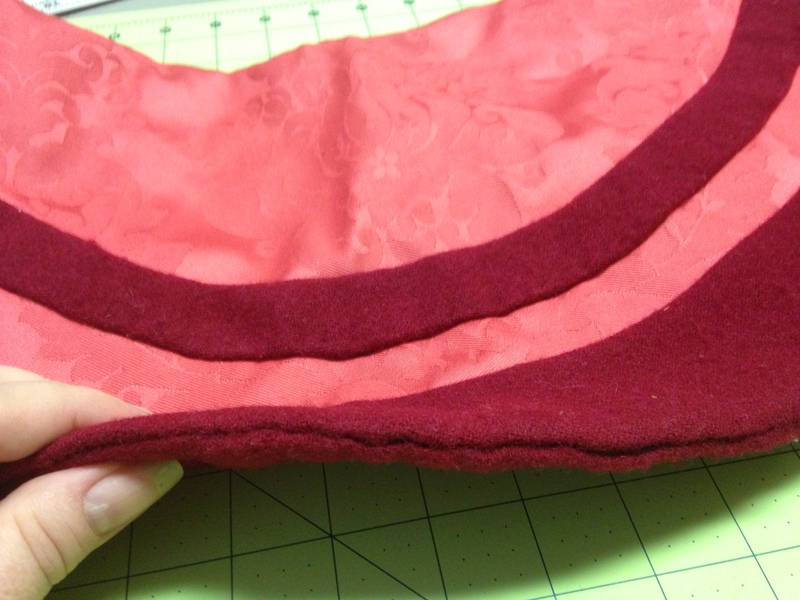 Keep tucking until all the raw edges are pushed into the center of the stitching. Step 5 – Pull It Together. 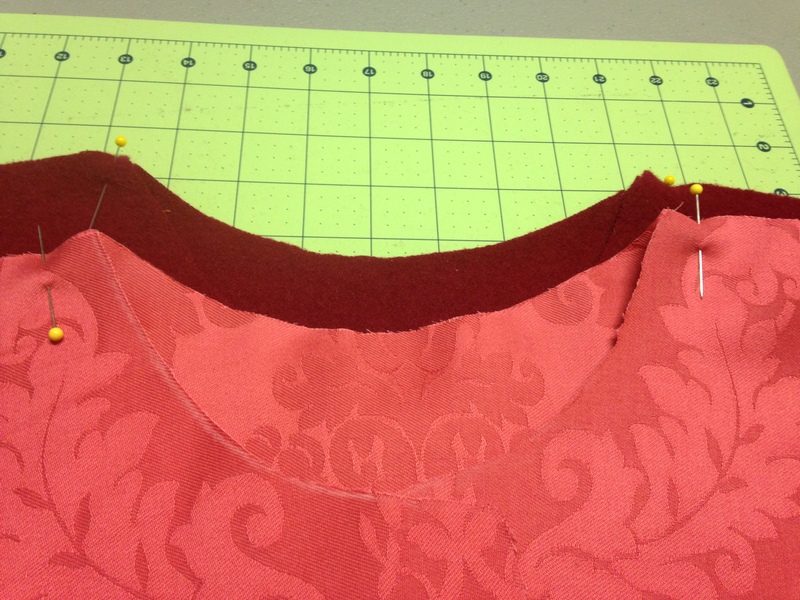 Once you have all the edges tucked in, gently pull the thread tightly to draw the button closed. 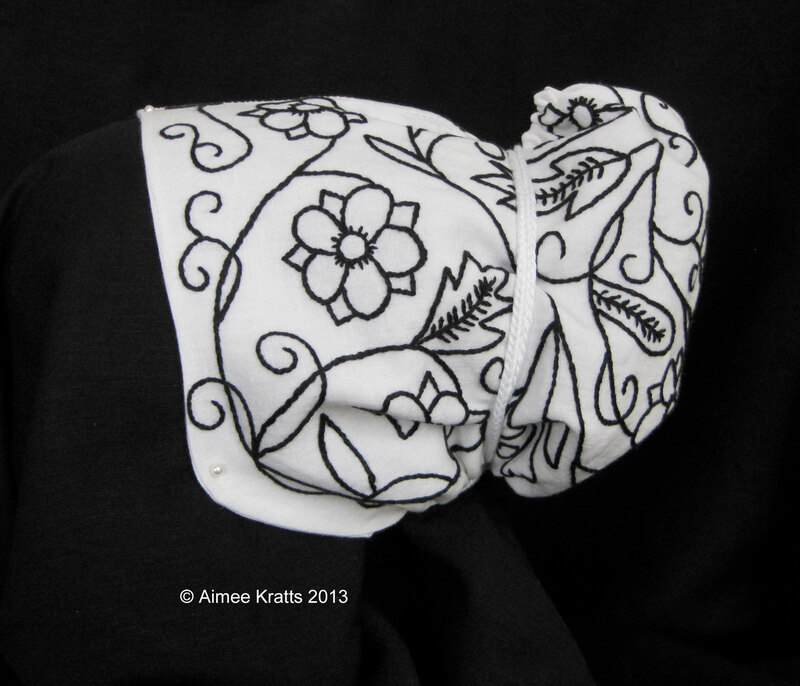 Step 6 – Stitch It Up. 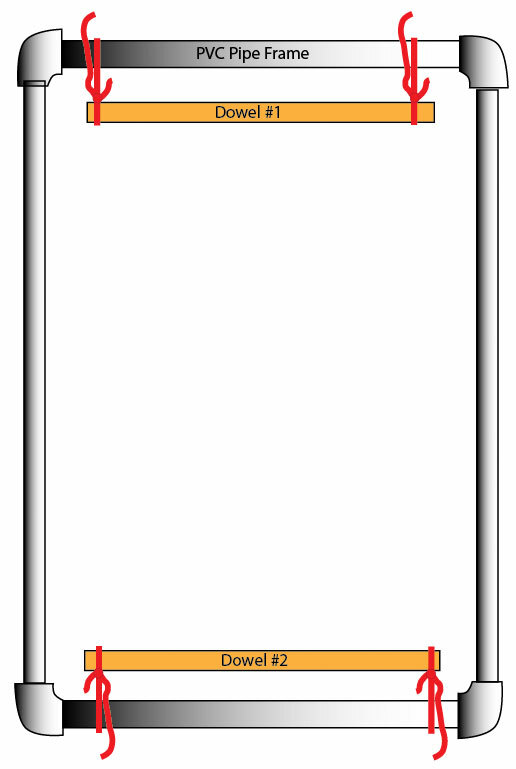 Now is your chance to lock everything together and adjust the shape of the button. With the gathered side of the button up, push the needle through from one side to the other and draw it tight. 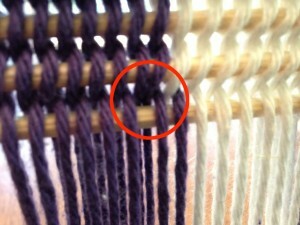 Do this at intervals around the button, keeping close to the bottom, gathered edge. As you stitch, the button will pull together more tightly and become firmer. 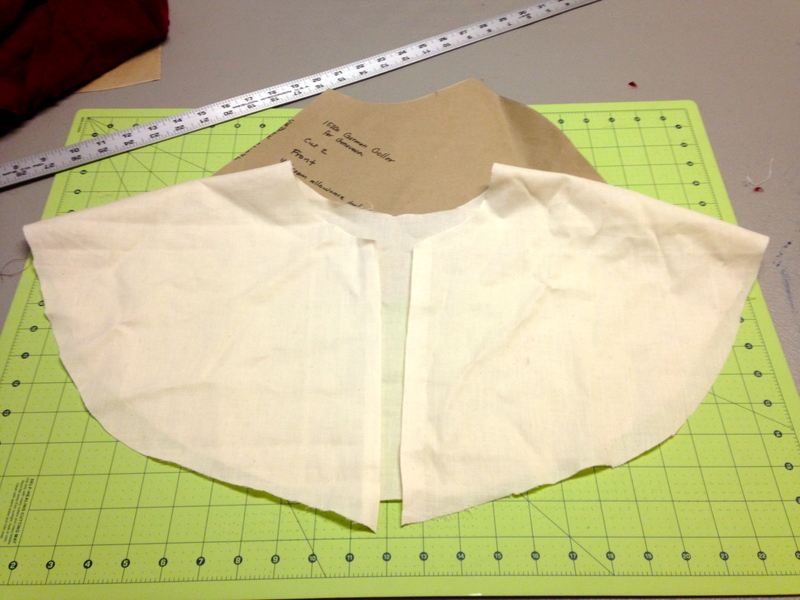 Step 7 – Shape Up! Flip the button over and check the shape. If it’s not quite as round as you would like or if there’s a little bit sticking out oddly, it can be adjusted. 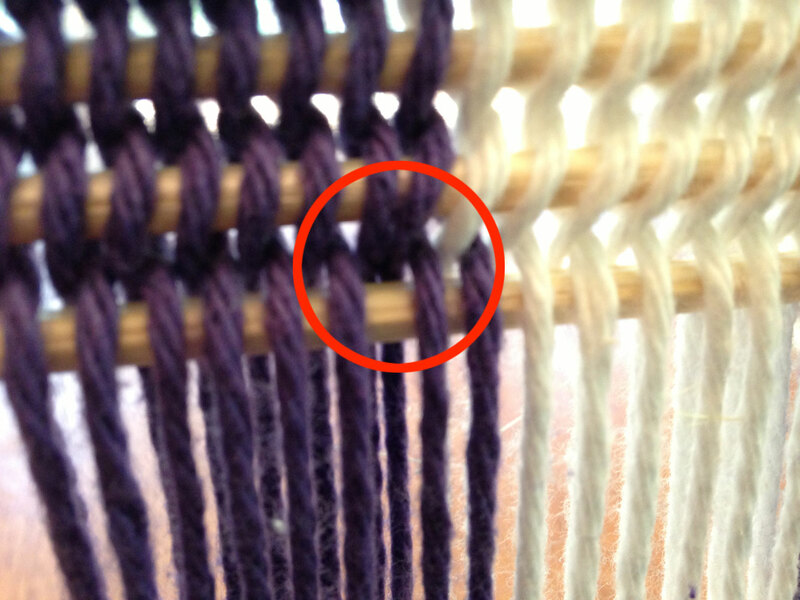 Here you can see my needle pointing at a funny little bulge on one side of the button. 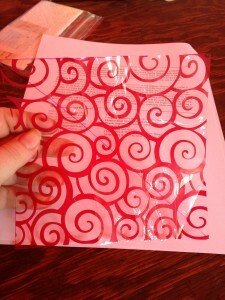 To fix this, flip the button back over and make a stitch through the area sticking out to pull it in toward the center. Presto! The odd corner disappears! 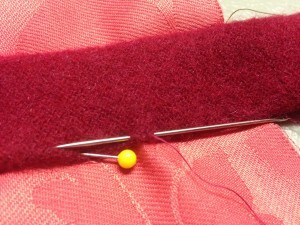 Once the button is the shape you want, draw the thread to the center on the bottom side and knot it. Leave the tail of thread for attaching the button to your garment when it’s ready and your button is done! 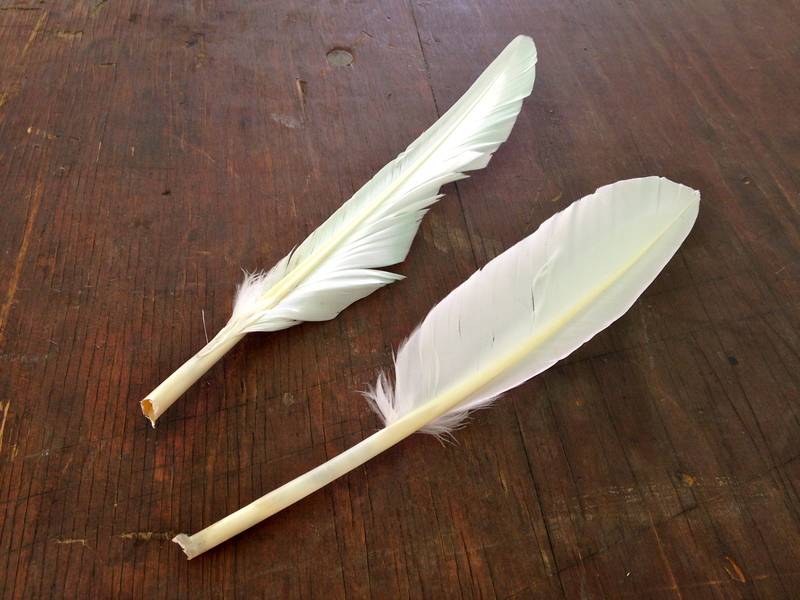 I write to you from a place of deep relaxation and contentment, put there by the amazing Asalah …. despite the fact that she is many miles away. How is this possible? I just applied her magical henna that smells sweetly of earthy lavender. 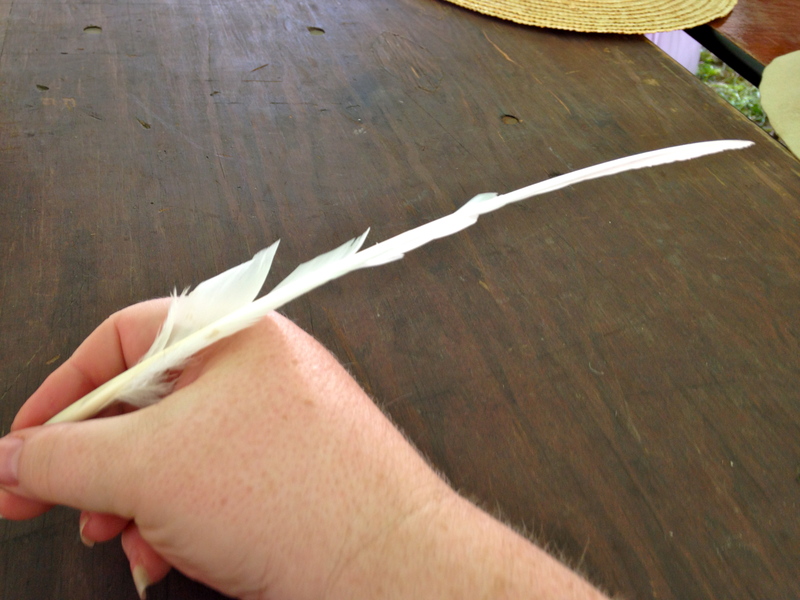 It’s all over my hand, swirling in big hearts, exotic flowers, and adorable curly-qs. I feel light and happy and loved. 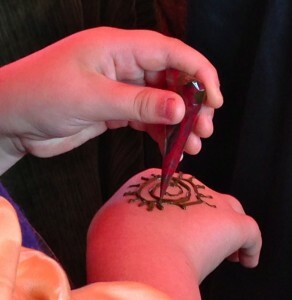 I had no idea henna was so magical, and I may not ever have known had it not been for Asalah. THL Sayyidah Asalah al-Hina (formerly known as Anabel de Berchelai) is an avid student of the Safavid period of Persia, making her a fellow 16th century enthusiast. Asalah is best known in our Society for her henna research and application, which she’s been doing for more than eight years now. She also enjoys making clothing and accessories, and in fact this year’s Kingdom A&S project were two pair of sock-boots. Her favorite project so far isn’t so much a created thing as a living thing. She is growing a henna plant, from which she’s created her own paste. 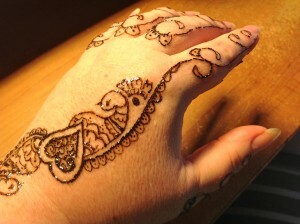 She was able to compare her fresh henna against that of store-bought, which is what nearly every is using these days. In addition to her three Kingdom A&S first place awards in 2012, 2013, and 2014, Asalah is the recipient of the Order of the Evergreen. She is apprenticed to Duchess Rebekah MacTiernan. Asalah makes her home in the Barony of Roaring Wastes in the region of Pentamere within the Middle Kingdom. 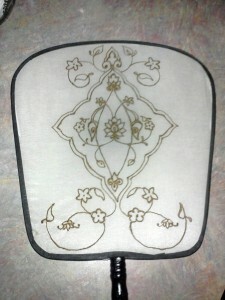 You can see more of Asalah’s projects and photos at her blog at http://gildedlotushenna.blogspot.com. 1. Prepare some henna paste and put it in a small cone. 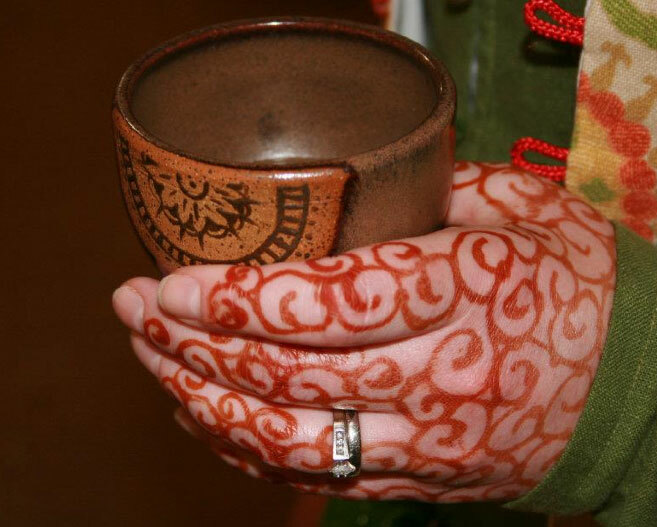 Asalah had already done this for her students, but she gave us this information on how to do it: As henna recipes and practices were handed down generation to generation, the basic recipe has probably not changed too much since medieval times. 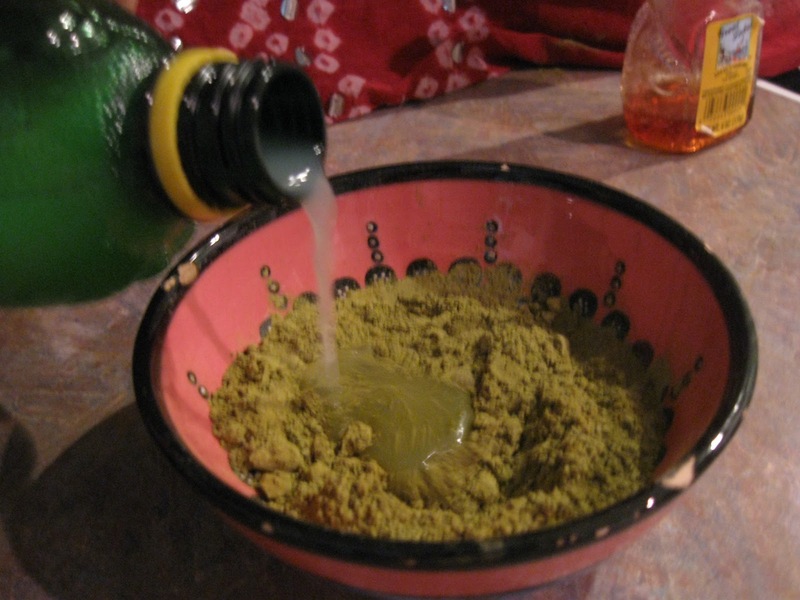 The basic ingredients include henna powder (dried and crushed leaves of the Lawsonia inermis plant), something acidic to release the plant’s dyes (lemons and limes were found to be used in period), and something sweet and sticky to help the paste stay on the skin (honey was the most common and readily available sweetener in the SCA time period). Essential oils that contain monoterpene alcohols are added to help bring out the dye as well as make the paste smell good! In a glass, ceramic or plastic bowl mix together 20grams (about ¼ cup) henna powder and ¼ cup lemon juice. Stir with plastic or wooden spoon as metal may react to the acidity in the lemon juice. The paste should be thick, about the consistency of lumpy mashed potatoes. Cover with plastic wrap (push wrap down over surface of henna so it is mostly airtight and add a second layer of wrap over the bowl). Let the paste sit in a warm area (70-80 degrees F) for 8-12 hours. Add 1-1 ½ tsp. 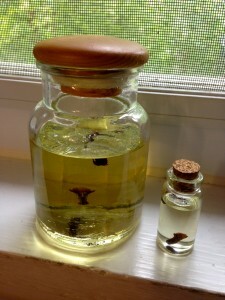 of essential oils and about 1 ½ tsp. of sugar. Use a little less if using honey. 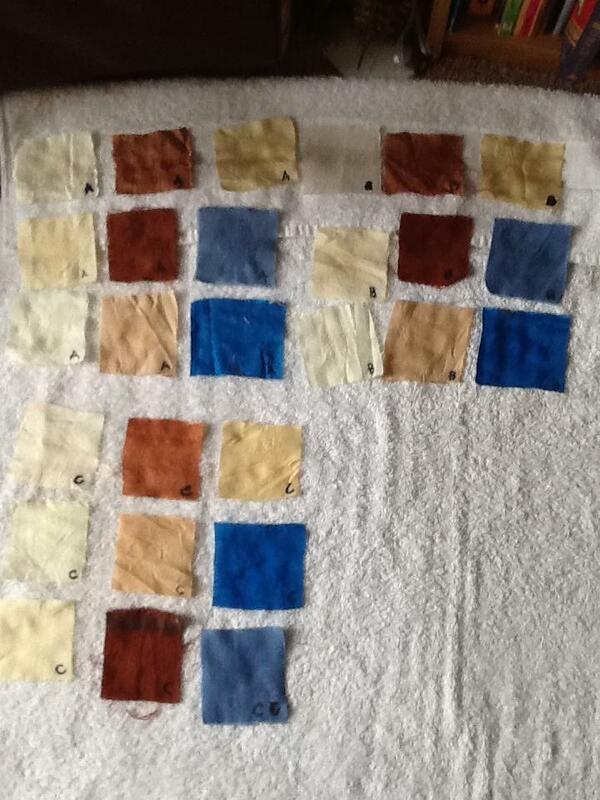 Stir until smooth, cover again with plastic wrap and let sit again for another 8-12 hours, or until dye release. The surface of the paste will turn brown when it has achieved dye release. Stir in enough lemon juice, a drop or 2 at a time, until the consistency you would like is reached, similar to that of yogurt. Cone or bottle henna and use within 2-3 days or refrigerate up to a week or 2, freeze up to a year. Important Note: Do not ever use a product called “black henna” — these may contain chemical additives that can cause serious and permanent damage to your skin. 2. Wash the area you intend to apply henna to clear it of dirt and oils. If you’re not near a sink, an alcohol swab will do (that’s what came in Asalah’s kit). I prepared my left hand. 3. 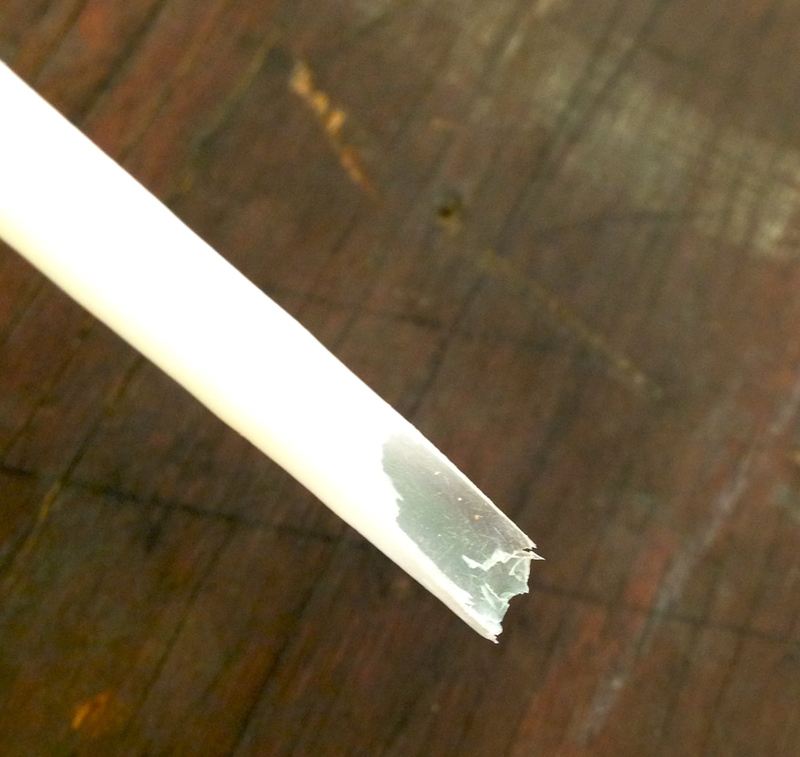 Cut off a very small bit of the tip of the cone. 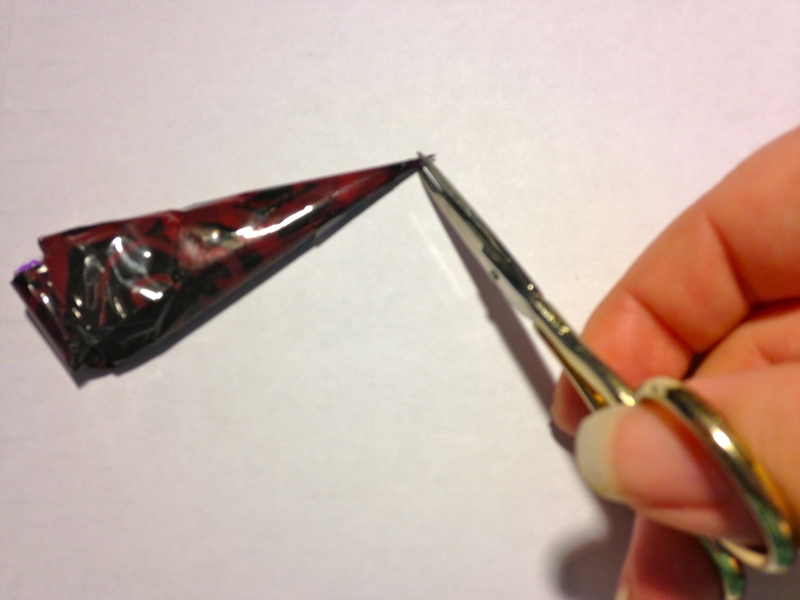 The smaller the hole in the cone, the finer you can apply the paste and get more details. 4. Hold the cone like you would a pencil. Apply light pressure at the base to squeeze a small amouny. 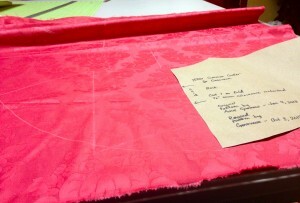 Practice tracing patterns on a sheet of paper first. 5. 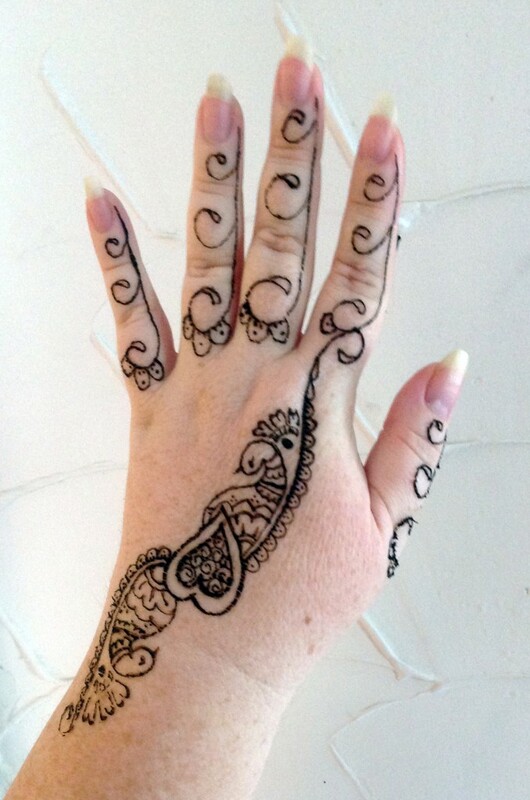 Touch the henna to your skin and slowly squeeze the cone as you move. I found I had the best results when I kept the cone lightly against my skin and went carefully and fast enough that the paste did not bunch up. I recommend you start a design in the middle of your area and work outward — that worked best for me. I started with a modest little heart. 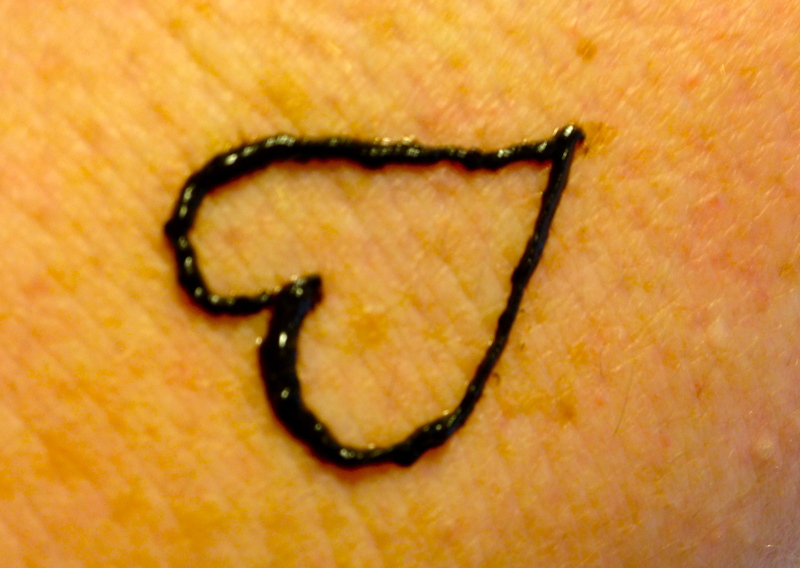 Then I added some curly-qs inside the heart. I had so much fun I kept going and ended up with this! 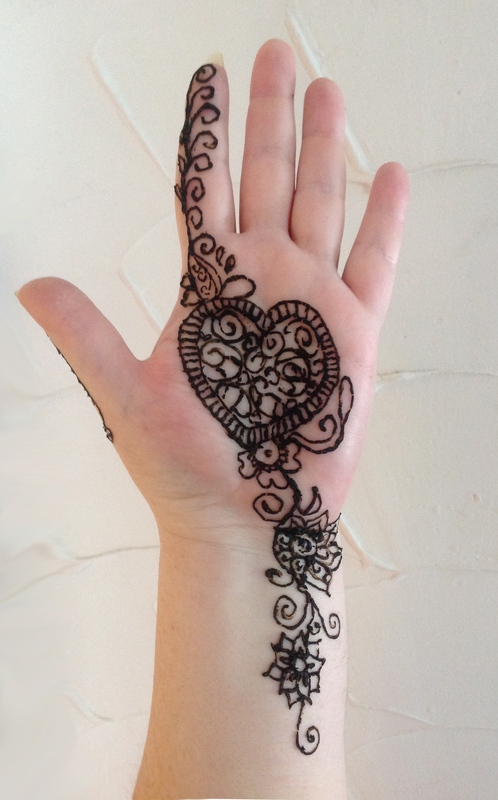 I still had henna left in the cone, so I went for broke and did the inside of my hand, too! 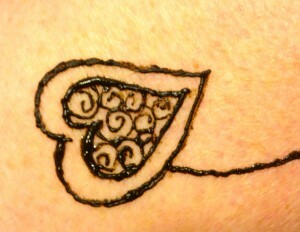 I wasn’t able to photograph myself applying it, but here is a student at Asalah’s class putting on her henna. 6. 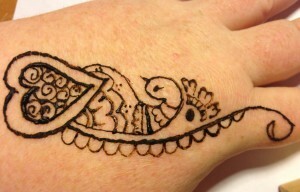 Once your henna has dried to the touch, but is not yet crackling and falling off, seal it with a lemon/sugar mixture. 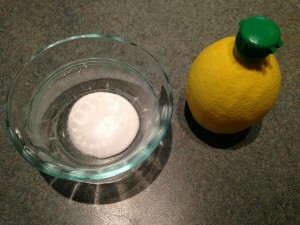 I mixed one tablespoon of sugar with one tablespoon of lemon juice, microwaved it for 30 seconds, then allowed it to cool. Then I lightly dabbed the henna with a cotton swab. 7. Now let your henna paste stay on for as long as you can. (I am currently typing this article one-handed as my henna paste is still on). So far its been on for 2.5 hours, which is reallythe minimum. If you can, keep it on for 6 hours. You can leave it on overnight if you wrap it in some tissue. 8. When you’re ready, the paste can be scraped off. Do not wash it off and avoid contact with water for 12-24 hours, as getting the stain wet too soon may prevent it from darkening fully. It should darken into a reddish brown over the next 24-48 hours — to protect it, you can apply a thin layer of vegetable-based oil or beeswax-based balm before showering or bathing. Tip: You can apply henna to wood, fibers, and hair, too! I was intrigued by the idea of learning to craft and complete a cloisonné enamel piece, an art form I’ve long admired but felt must be particularly complicated. And she was bringing a kiln, too? This was simply too good not to try. And I did … and it was more amazing than I thought it would be. 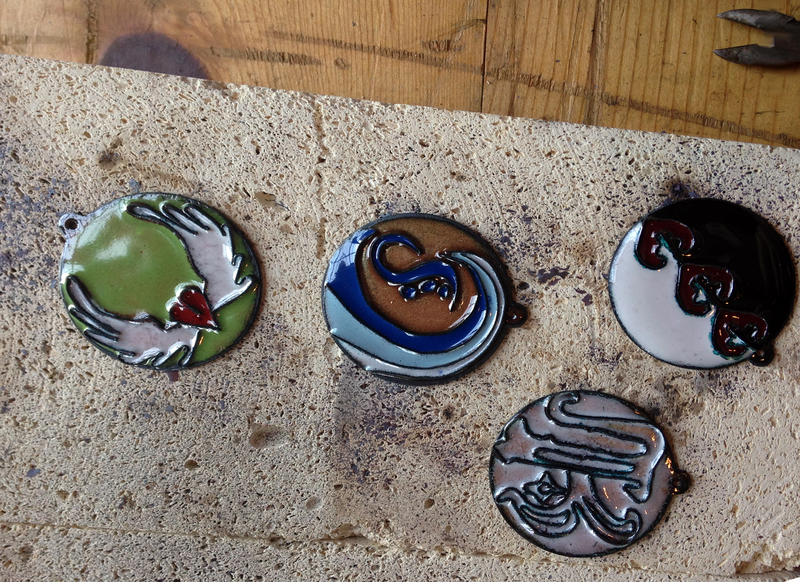 Gwenllian proved to be an excellent teacher, offering just enough information without overwhelming us, answering all questions cheerfully, and providing everything we needed to create beautiful cloisonne pendants. 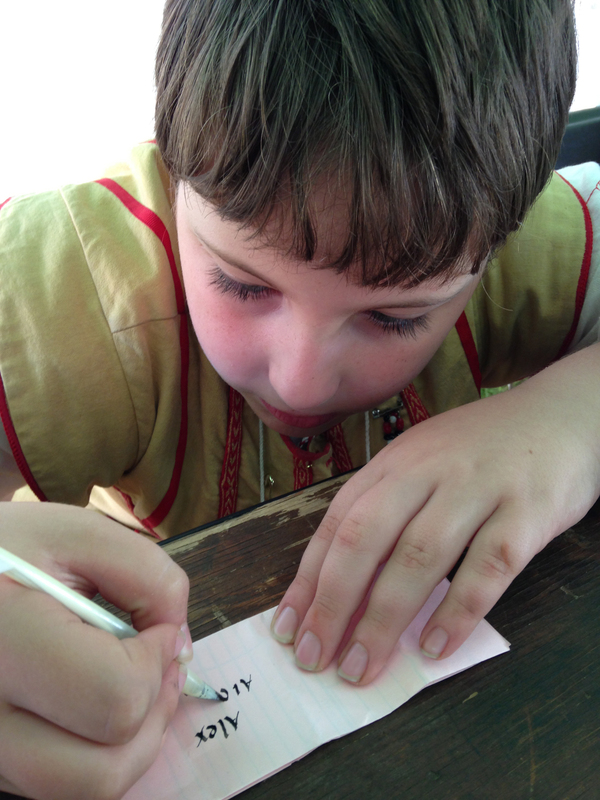 Not surprisingly, teaching is what Gwenllian loves most about her art. “Mine is an art that looks complicated, but can be fairly easily accomplished in a decent amount of time,” says Gwenllian. 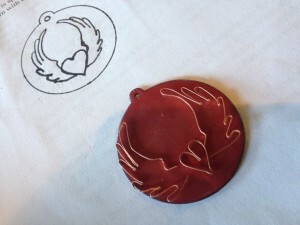 “When my students are just SO excited about this awesome shiny thing they’ve made and are just so proud of it, I LOVE it!” And that was certainly my experience — I was so enthralled with the pretty pendant I made in her class that I showed it to anyone and everyone who was willing to look! Gwenllian’s favorite artifact created so far is the Byzantine-style cloisonné medallion she entered in this year’s Kingdom A&S Competition (and for which she took a first place). “It was a bit tedious,” she confesses, “but so satisfying. 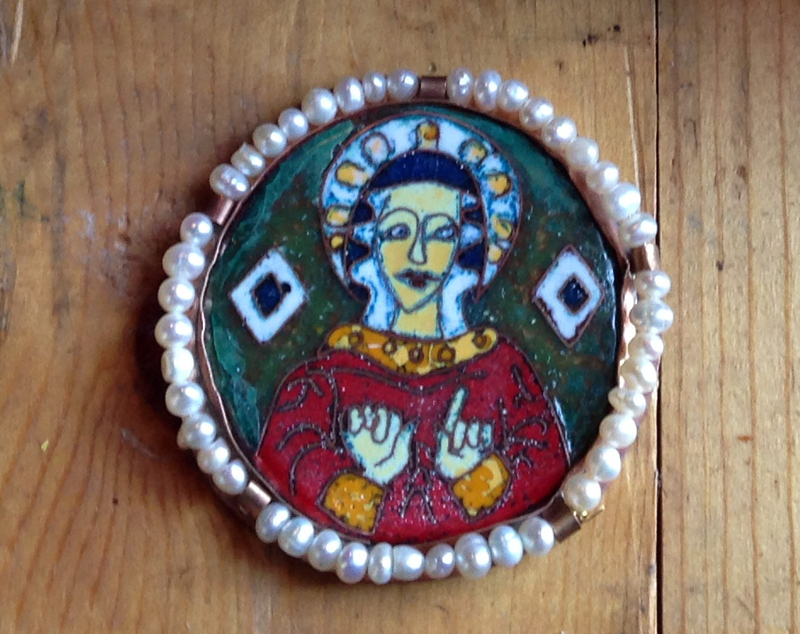 And it’s inspired me to do more pieces, try new and more period techniques of firing the enamels, and try to grind my own enamel powders.” Her medallion is really quite delightful, and looks remarkably like those that appeared on the original votive crown of Emperor Leo VI of Byzantium. 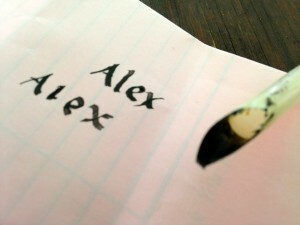 To learn more about Gwennlian’s arts, be sure to visit her blog at http://hareandfox.blogspot.com. 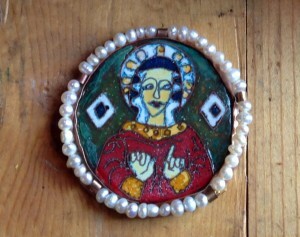 You’ll find excellent in-progress photos of her Byzantine medallion there. 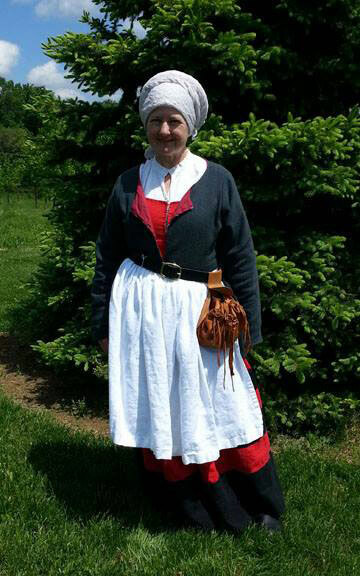 Gwenllian, who has received the Order of the Willow award, is apprenticed to Mistress Helewyse de Birkestad and plans to teach her Cloisonné Enameling class again at Pennsic 43 on August 4th at 5:00 pm and on August 6th at 4:00 pm, both in classroom 4—the class is most definitely worth the three hours and you’ll leave with a simply gorgeous piece of cloisonne with your own design! 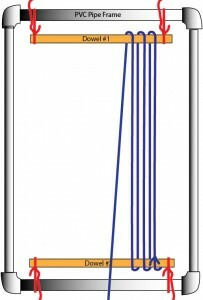 This step-by-step tutorial is based on Gwenllian’s class on June 21, 2014 — the photos and steps are those I took at the class. First, what is cloisonné’? 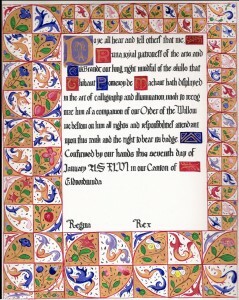 The dictionary describes it as enamelwork in which colored areas are separated by thin metal bands fixed edgewise to the ground. The word enamel comes from the Old High German word smelzan (to smelt) via the Old French esmail. The ancient Egyptians applied enamels to pottery and stone objects, and sometimes jewelry, though the last less often than other ancient Middle Eastern cultures. The ancient Greeks, Celts, Georgians, and Chinese also used enamel on metal objects. 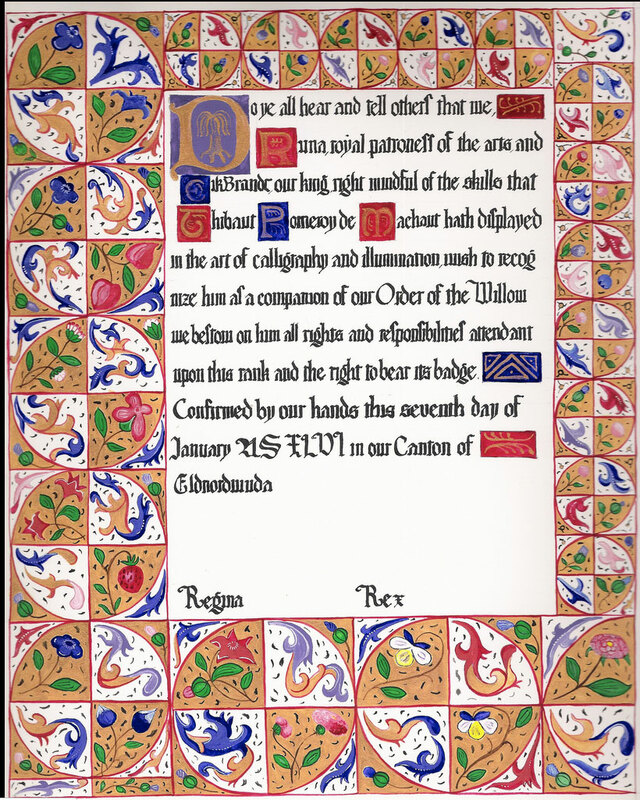 Leading up to cloisonne in particular though, enamel was at its most important in European art history in the Middle Ages, beginning with the Late Romans and then the Byzantines who began to use cloisonné enamel in imitation of cloisonne inlays of precious stones (Faux stones?! Oh wait, we still do that today). This style was widely adopted by the “barbarian” peoples of Migration Period northern Europe. 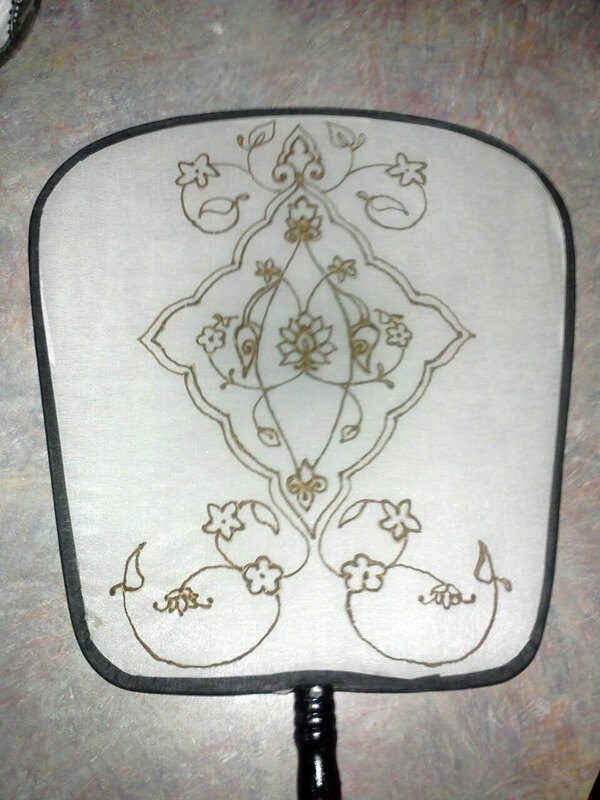 There are many examples of cloisonne that is very comparable to garnet inlay. The Byzantines then began to use cloisonne more freely to create images, which was also copied in Western Europe. So let’s make something, shall we? It’s not as hard as it looks. Choose your design. 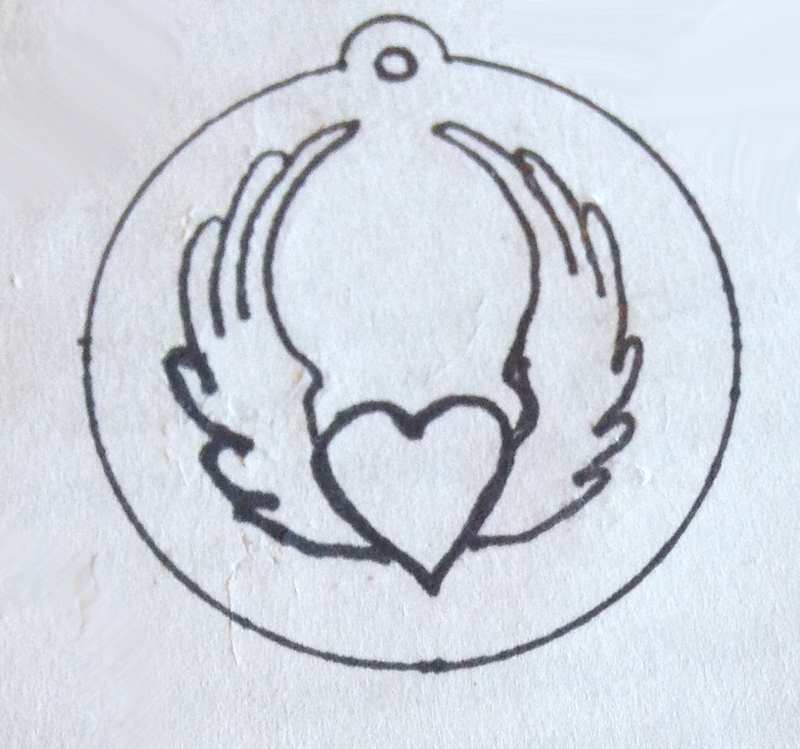 Start by outlining your copper circle and then draw your design inside it. Keep things simple, as each line means a piece of copper wire. Note that you are not required to have wires around each spot of color, only wires between different colors — this means you can have a color/design to right to the edge without needing wire there. 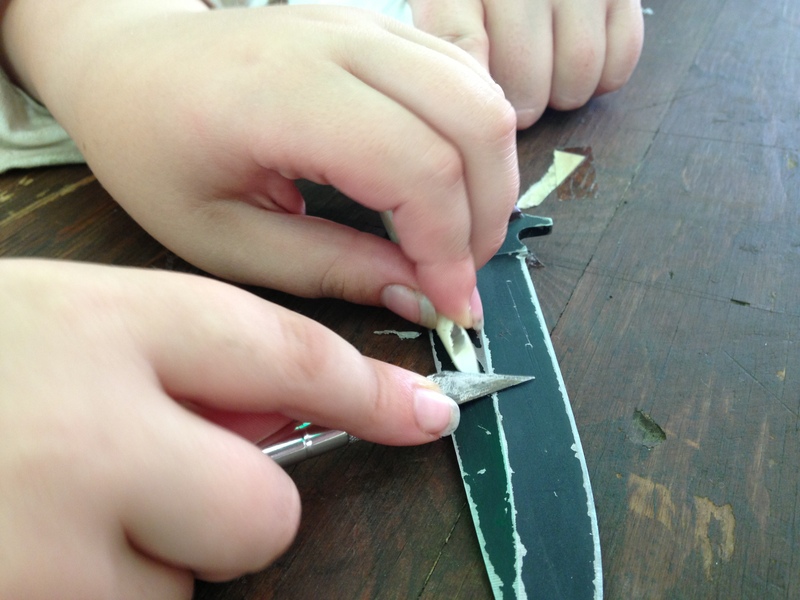 Follow your chosen design above by bending and cutting the wire to match your lines. Use your pliers and wire cutters for this step. This takes some time to get right — be patient with yourself. Apply an light brushing of oil to the copper circle, then transfer the wire one piece at a time to the prepared surface of the copper. This will help keep the wires from shifting when you pick it up in the next step. 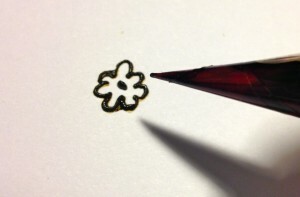 Fire your piece in the kiln to approximately 1800°F long enough for the clear enamel on the piece to soften enough so that the wires ‘sink’ into the surface. 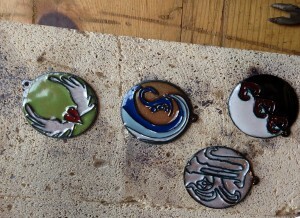 This enamel has a higher melting point, so the wires should not move while firing later colors. Allow time for the piece to cool sufficiently. The advantage of working with the smaller size is they take a shorter time to cool off. Mine took about 15-20 minutes. Mix some of an enamel with a small amount of Klyr-fire. Using a small paintbrush, carefully apply the enamel to your piece. Nudge the enamel into position as needed. Continue until you have the enamel colors placed on your piece up to the height of your wire, but not over it. 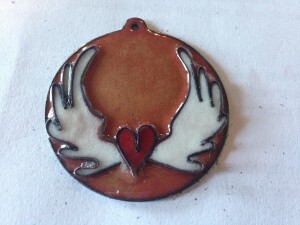 The goal here is to create an even layer of enamel all over the piece, out to the edges. Do not try to cover the cloisons as you will accomplish this on the next few firings, and doing so can make the enamels jump the fence to where you don’t want them. Let the piece dry completely. Any moisture left may steam or even boil if placed in the kiln and can create issues with your piece. 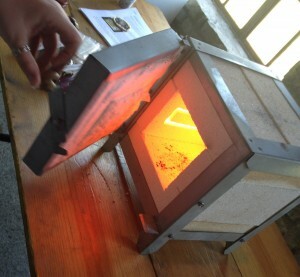 The piece can be placed on top of the kiln however, or in any other hot place to dry faster. Fire the piece again once it is dry. 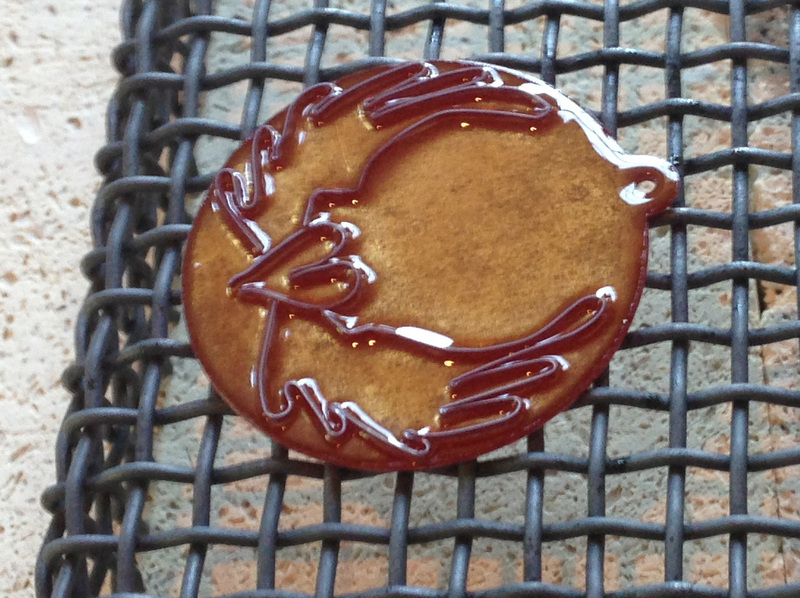 Place the piece into the kiln and let it fire until the powdered enamel becomes smooth and glassy. 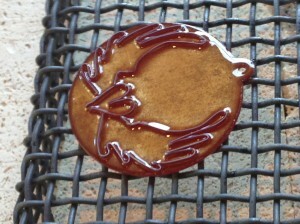 Once done, remove the piece from the kiln and set aside to cool. Repeat steps 6-8 until you have built up enough layers for the surface to be even with the wires. 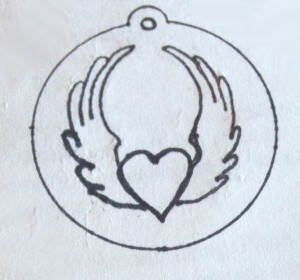 My piece required three applications of enamel. Gwenllian says that another finishing technique is to build up the enamel just over the wire, and stone (sand) it all to one flat surface—start with a stone or coarse sandpaper, and build up to finer grits until it is smooth and polished. 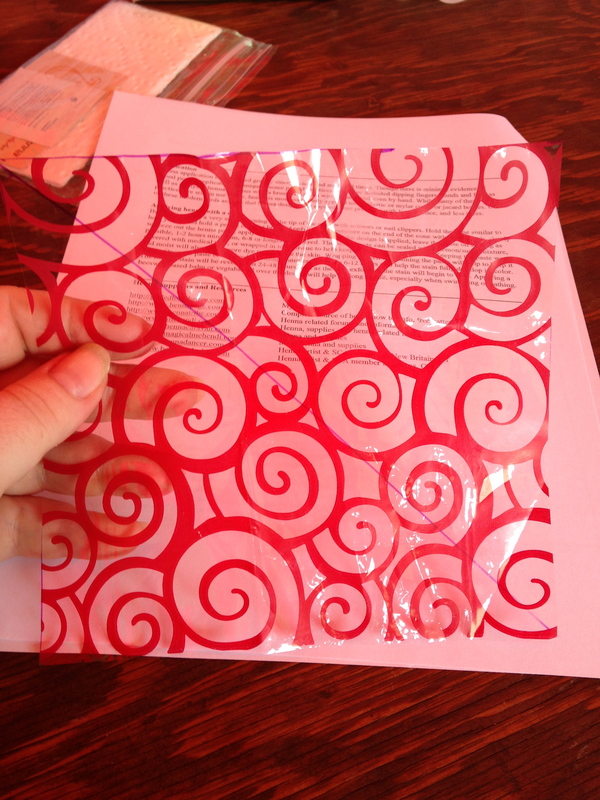 Please note this needs to be done as a wet-sanding method because of the glass. At this point you also have the choice to let your edges keep the oxidized look from firing, or you can file or sand them to the clean copper again, this is up to personal preference. I chose to leave mine as they were since I’d applied the enamel all the way to the edges. You can now loop a bail through the hole and show off your piece. 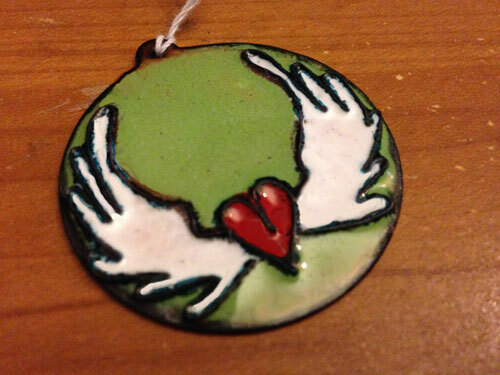 Here is my completed cloisonne pendant! 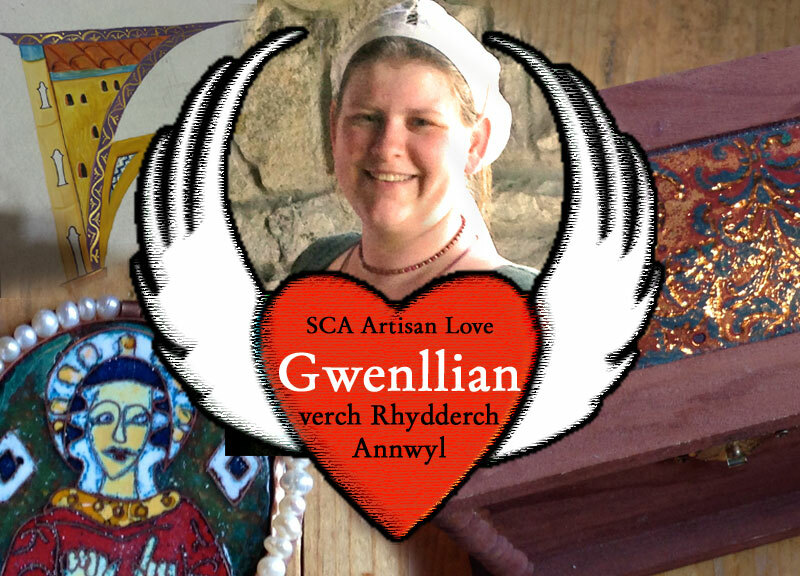 Thank you for sharing your knowledge and passion with us all, Gwenllian! So what is Heodez’s favorite discovery to date? She loves “discovering that we still have the same beauty concerns centuries later” as our for-bearers. Worrying about how we smell or about our gray hair is time eternal, apparently. Remedies for our present-day concerns were concocted and many of them actually work. And thus learning what worked for our great-great-great-great-great-great-great grandmother can work for us, too! Lady Heodez’s cosmetic projects during the last two years are extensive, evident by her own modern-day Book of Secrets, the Segreti del Pavone (“secrets of the peacock”) blog. Here you’ll find recipes for a wrinkle reducer, lavender perfume, hand whitener, underarm deodorant, rose soap, acne soap, blusher and lip color, diet drink, hangover remedy, velvet stiffener, cough drops, facial cream, shampoo, conditioner, face whitener, incense, hair remover, lip balm, astringent, mouthwash, grease stain remover, tooth whitener, and scented hair powder. 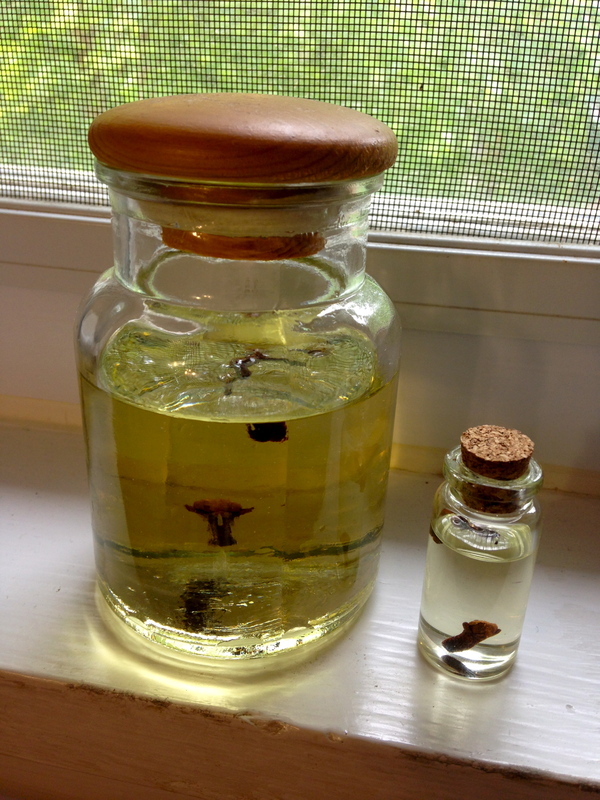 This is a veritable pharmacopeia of wonders! Imagine yourself making a variety of Heodez’s beauty products for your next camping event to really take your immersion to a new level. This is one of my personal goals for Pennsic! And I would be remiss in leaving out Heodez’s interest beyond cosmetics. She’s redacted recipes for stiffening velvet and making artificial pearls. I myself made fake pearls based on her recipe over a year ago — that was a fun adventure! Heodez also enjoys sewing, embroidery, and dance. She is an apprentice to Mistress Sarafina Sinclair. Heodez is a fellow Midrealm A&S Pentathlon entrant, having won the Kingdom A&S Pentathlon last year and inspiring me to enter this year. 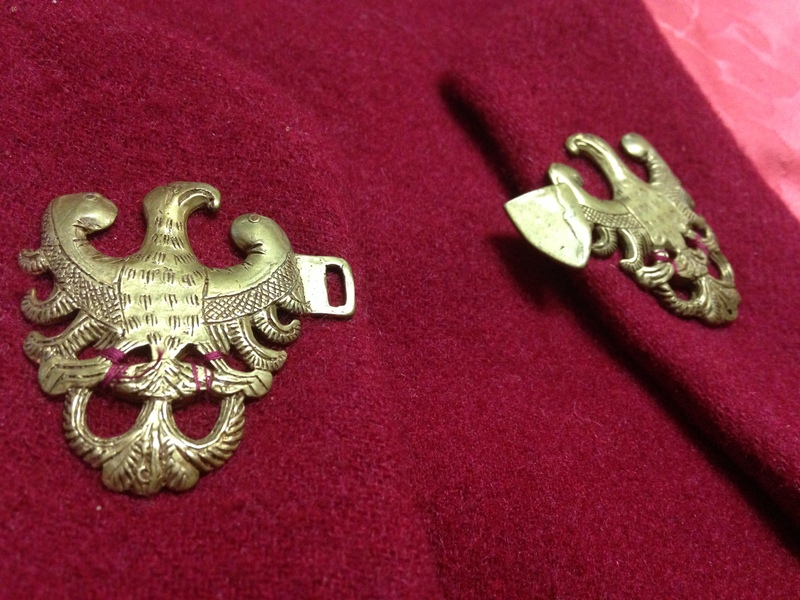 She was also the Middle Kingdom Arts and Sciences Champion and the Middle Marches Baronial A&S Champion in 2013. She is a member of the Order of the Silver Oak. 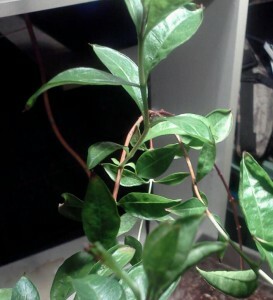 I personally feel her leaves shine green in all four seasons — if you agree with me, please do let Their Majesties know. 1. 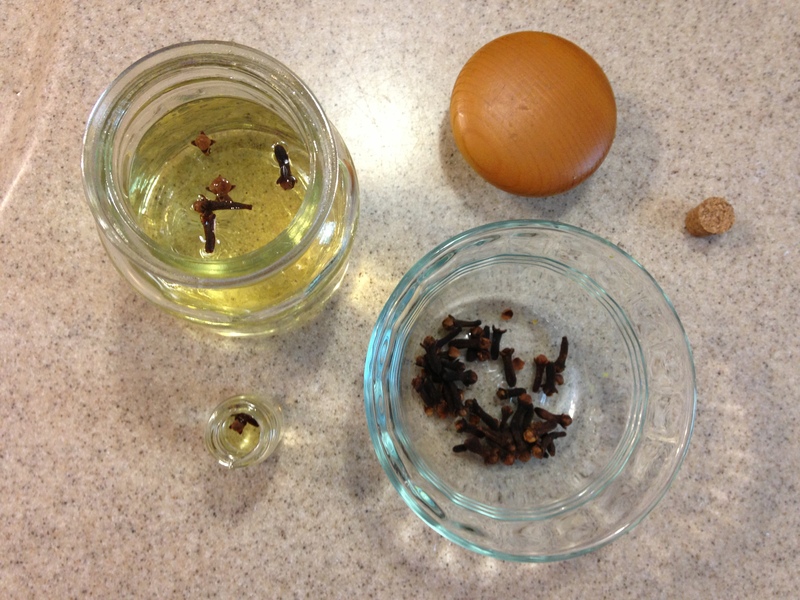 Procure some almond oil (sweet), whole cloves, and a small glass jar. 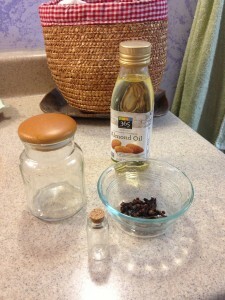 Historically you would have ground almonds to release their oil. I bought all from my local Whole Foods store. 2. Fill your jar 3/4 full of almond oil, then place 2 or 3 whole cloves in the jar and seal it tightly. 4. Place this jar in your sunniest windowsill for about four days. 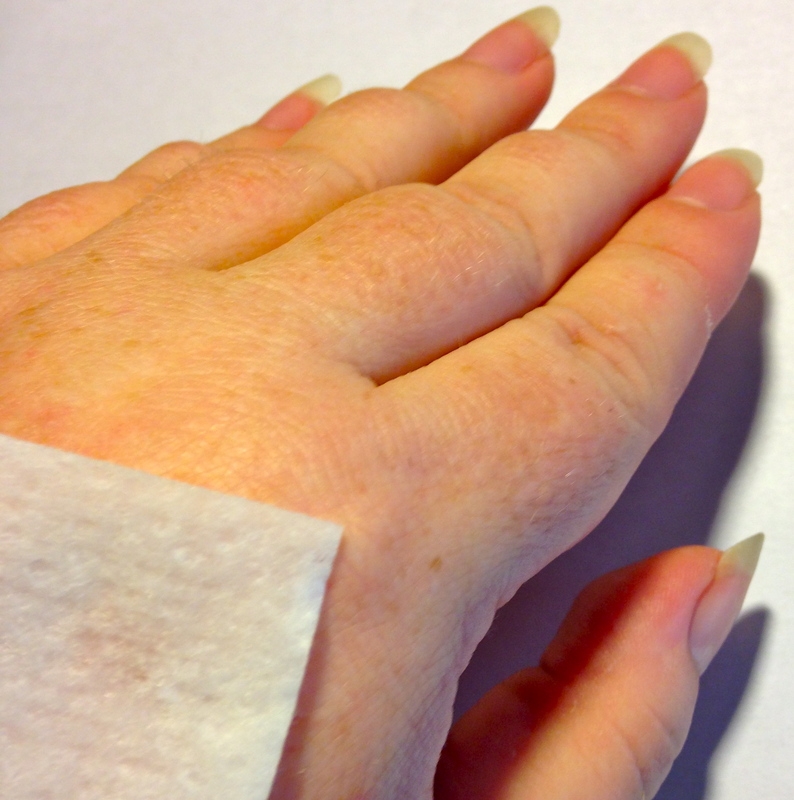 You have now created a hand softener which is lightly scented and long lasting. 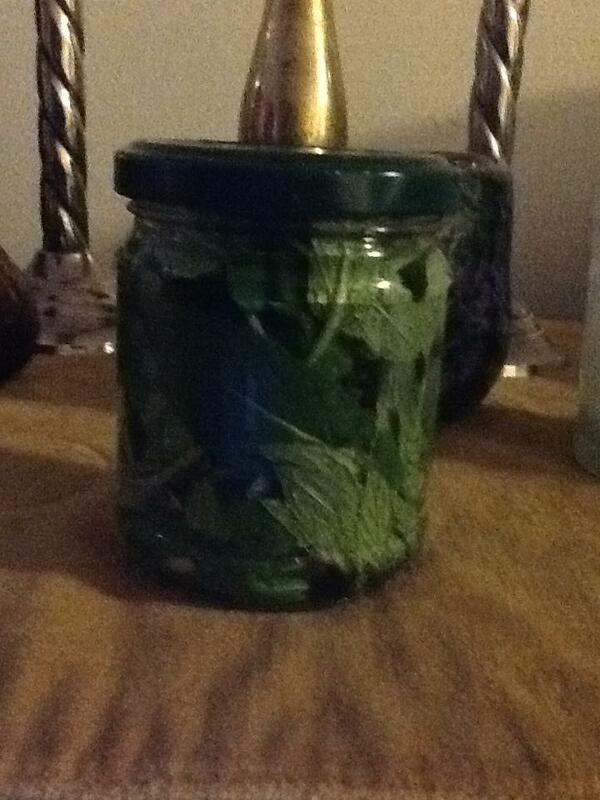 You only need a small dab, so a little jar lasts a long time. It also makes a wonderful facial moisturizer during the winter. Almond oil does not clog the pores and is hypoallergenic. The oil has a lovely scent of cloves, but not at all overpowering. I’ve been applying the oil to my hands for several days now and they are indeed very soft! 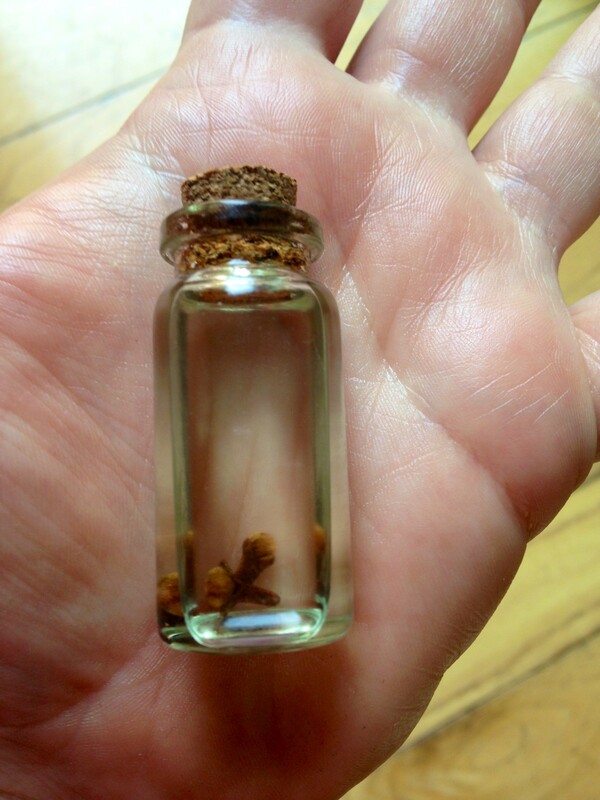 This little bottle will be going in my toilette kit for Pennsic! 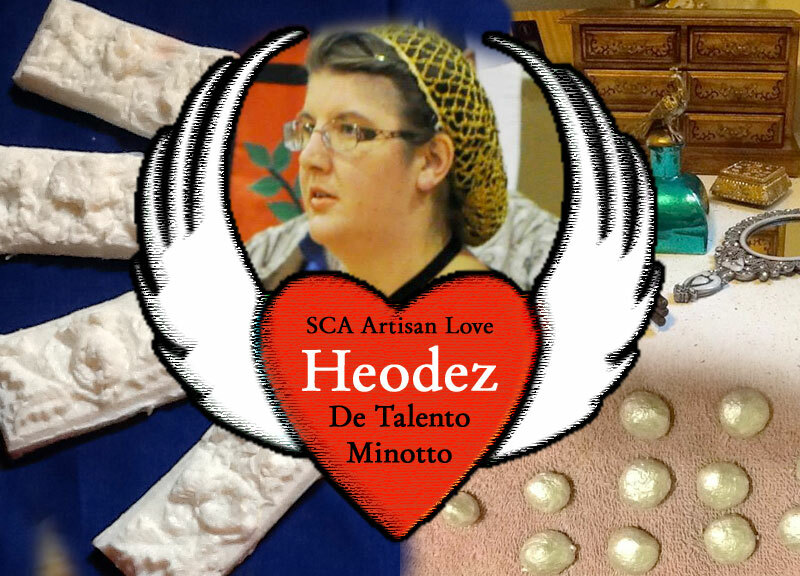 Lady Heodez was nominated for this project by THL Philippa Montague, who wrote to me to say, “in addition to two pentathlons in two successive years, [Heodez] teaches classes and sends her students home with handfuls of samples and recipes. (The medieval bilberry deodorant was as startlingly effective as advertised, plus it didn’t freeze when everything else froze at Gulf Wars!)”. Would you like to nominate someone to be featured here? Leave a reply or contact me directly! 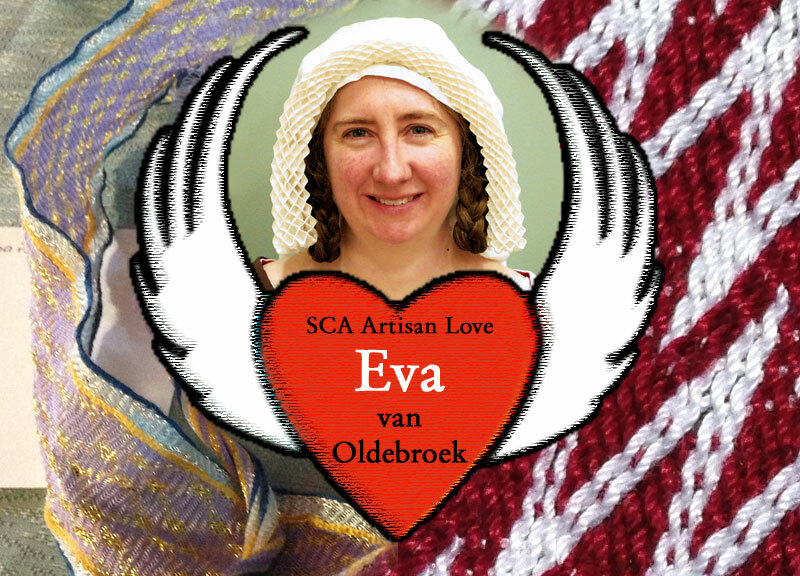 The Honorable Eva vanOldeBroek tells me she is “craft ADD,” but I beg to differ. Learning just one of her arts — sprang — took a considerable amount of focus and dedication on my part. 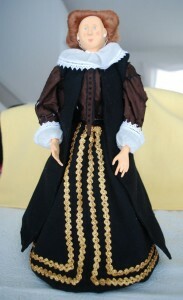 I think a better term for this talented artisan would be “renaissance woman” of the A&S world! 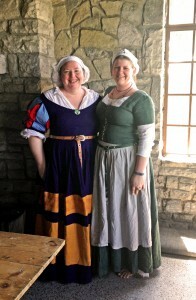 Her interests include the fiber arts, sprang, knitting, embroidering, sewing, weaving, calligraphy, illumination, sugar paste subtleties, and mead making! When I asked Eva what her favorite project has been so far, she named her sprang garter that took a first place at Kingdom A&S last month. 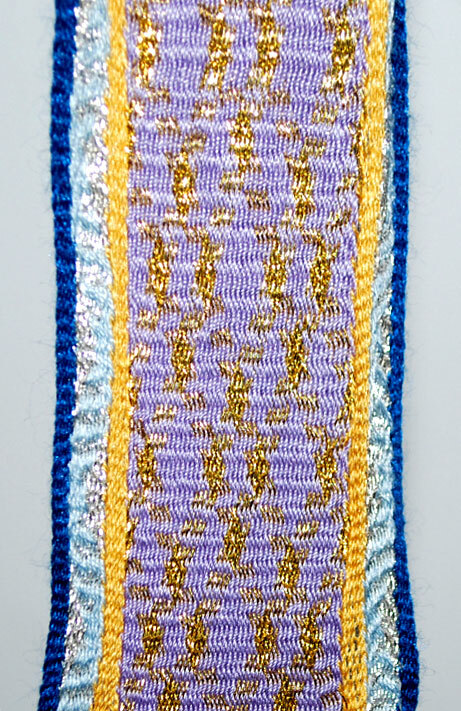 “The garter was a challenge, not just in actually braiding, but in figuring out the precise pattern,” says Eva. 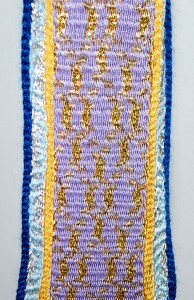 “There was a bit of trial and error before I decided on a technique that would closely match the original piece.” You can see a portion of the intricate sprang garter in the image above and a closeup to the right. You can see more of Eva’s work, and read about her projects and progress at her web site at http://evavano.dreamwidth.org. 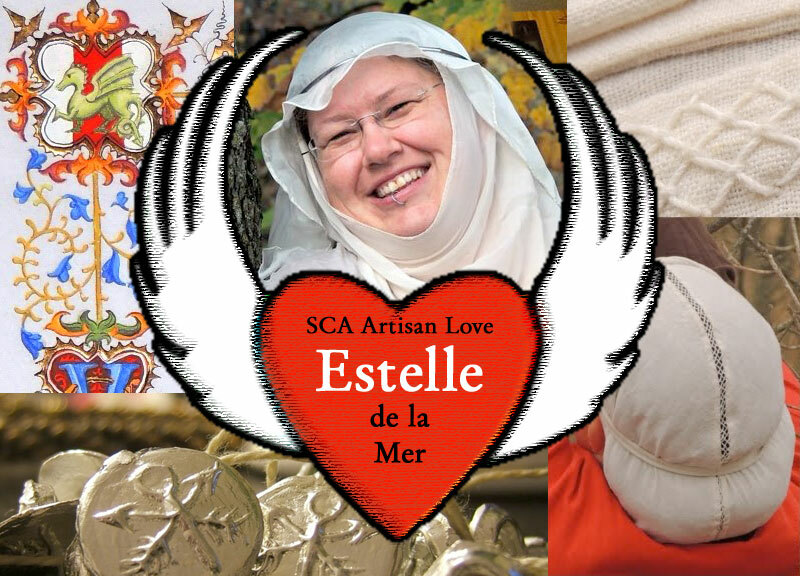 Eva was Andelcrag’s Baronial A&S Champion in 2009-2010, the recipient of the Order of the Evergreen, a consistent entrant and judge in our Midrealm A&S competitions, and a frequent teacher of classes on sprang and veils. As I do, I asked Eva is there was something she could teach me. And as it happened, she was teaching a class that weekend in basic sprang. I took her excellent class and learned the basics. I went home, took photos of each step, and wrote down the directions so you could learn, too! First, what is sprang? 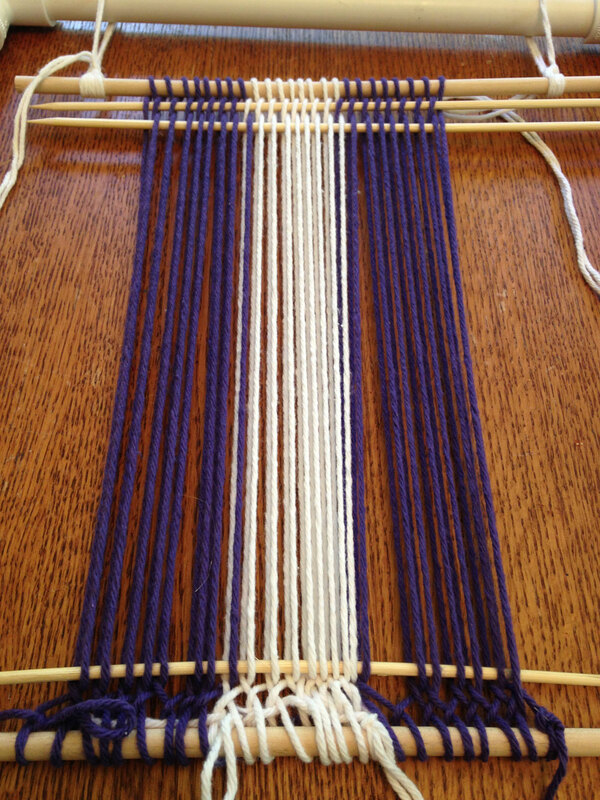 Sprang in a very old method of weaving (or braiding) threads together. 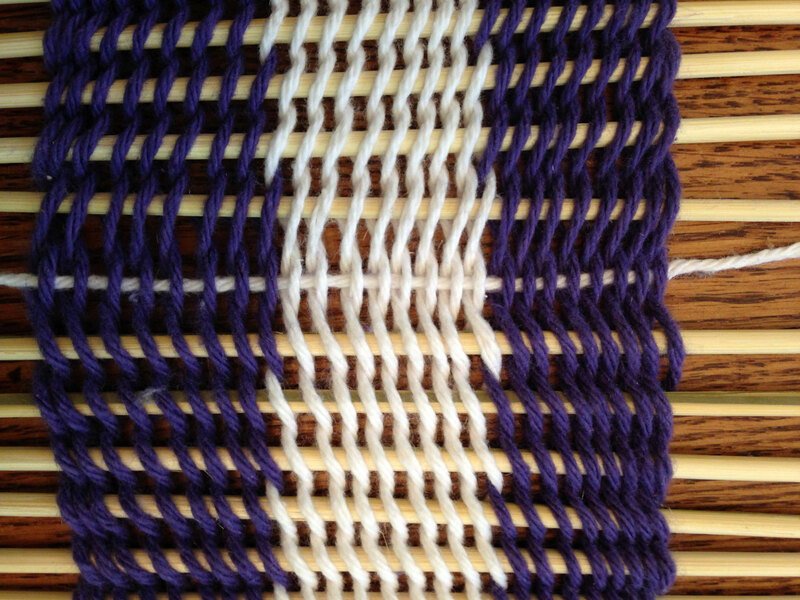 Sprang looks a bit like netting or knitting in some forms, but sprang uses only warp threads — no weft. Sprang goes back to the Bronze Age and was still in use as late as the 16th century (and beyond). Eva told me that sprang can be used for garters, belts, hairnets, stockings, scarves, and other purposes where a flexible material is required. Working sprang reminds me a bit of a solo cat’s cradle game, if you remember that. 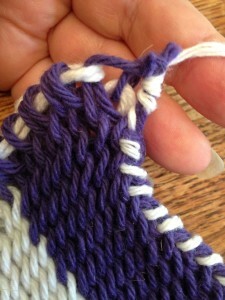 Threads are pulled out and twist as you go along, creating an intriguing interlock. 1. 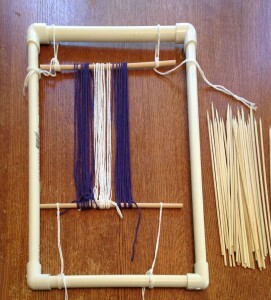 To get started, suspend your two dowels to the top and bottom of your frame like shown below. 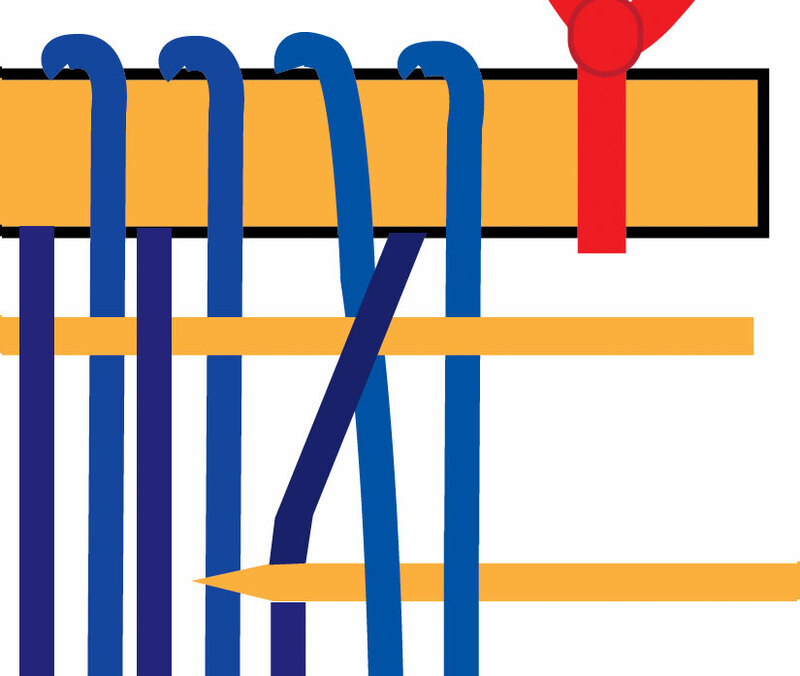 Tie it securely, but make sure you can untie it easily later (i.e., slipknot) as you’ll want to adjust the tension. 2. Now tie one end of your yarn to one end of one dowel, then begin wrapping the yarn (thread) around the two dowels in a figure-8 pattern, moving across. 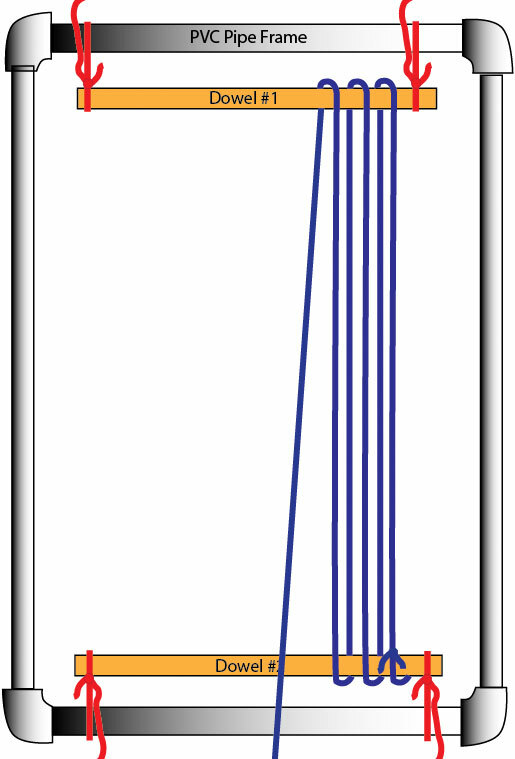 This is called warping. Continue until you have a good number of wraps — the one from Eva had 24 loops. 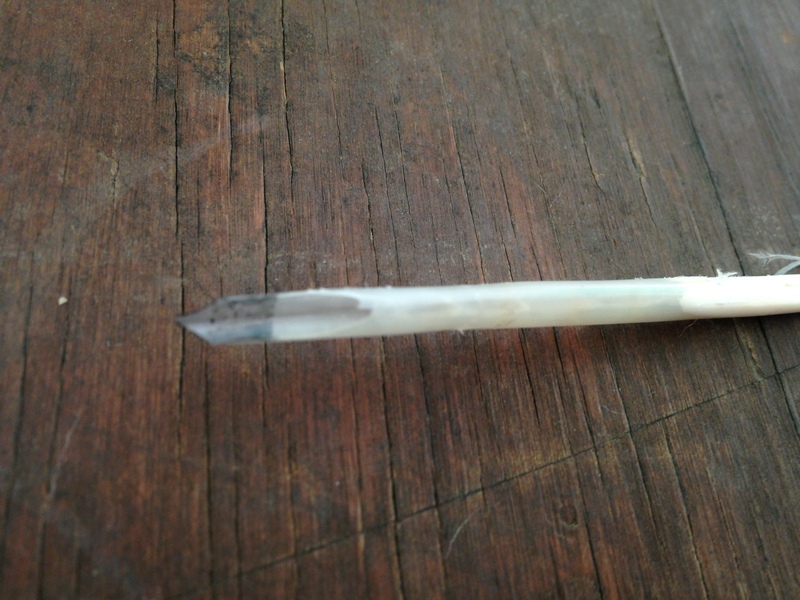 When you’ve reached the end, tie the end off on the same dowel as your first tie. 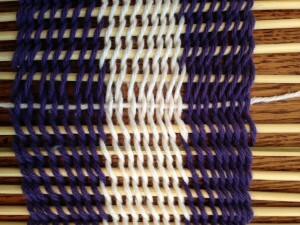 Note: Eva’s warp used two different colors, which was achieved by wrapping the center section separately in a different color. 2a. Check the tension on your warped threads. A lot of my problems were caused by the tension either being too loose or too tight. You want the threads to be stable enough to work with. 3. 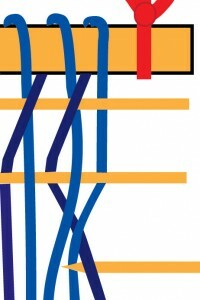 Now let’s organize our threads — insert one of your sticks into the top end of your threads, pulling the back ones forward and the front ones back alternately, as shown below. This really helped me get my threads separated! 4. Now it’s time to sprang! 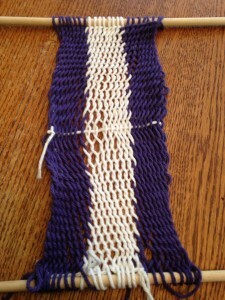 You will be alternating two rows of twists. 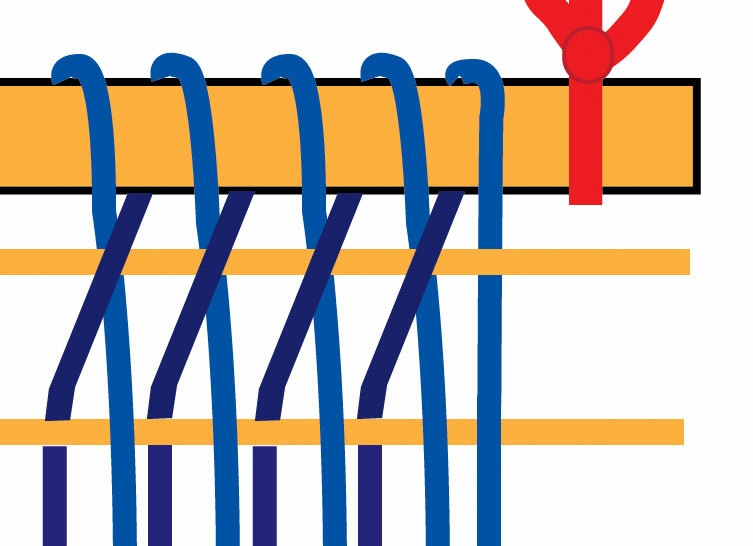 Starting with the first row, pull the two rightmost back threads forward and the one rightmost front thread back, in that order, like shown below. You can use a stick or your fingers — I preferred to use my fingers, but it was harder to take a photo of that. 4a. Bring the next back thread forward and the next front thread backward. Repeat all across the row. 5a. Bring the next back thread forward and the next front thread backward. Repeat all across the row. 5b. 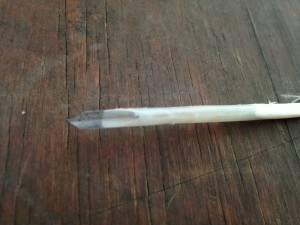 Insert another stick in the same spot and push the lower stick down and the upper stick up, just like in step 4c. 6. Continue alternating steps 4 and 5 until you run out of space (the twists will eventually meet in the middle), adjusting tension as necessary. 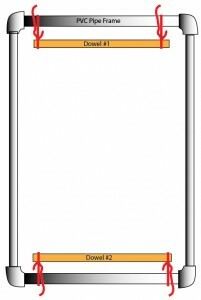 If you lose your spot (forget whether you should start with two back threads or one back thread, just check to see how many threads you started with last time. 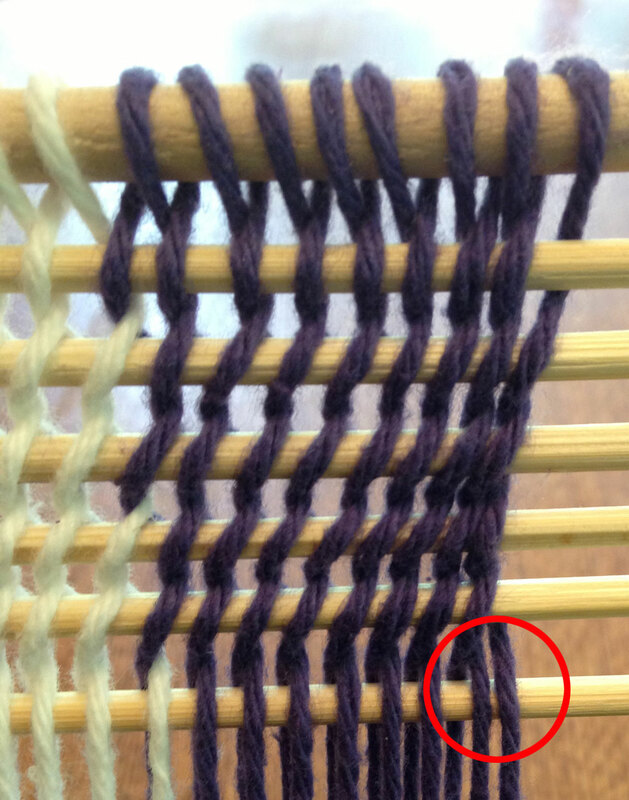 In the photo below, you can see that I started with TWO threads on my last row (I’ve circled those two threads to make it easier to spot them), so my next row would start with one. 8. When you get to the middle, Eva says you can either use a crochet hook and “chain stitch” the threads together, or run a thread through the center. I chose the latter. 10. 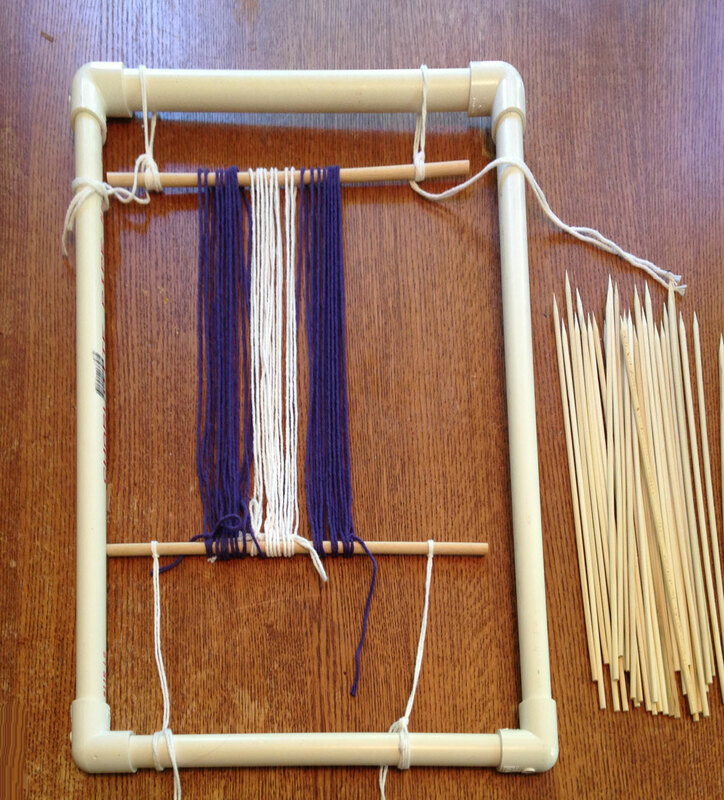 Cut a long length of yarn and carefully thread it through the top loops as you remove the top dowel. 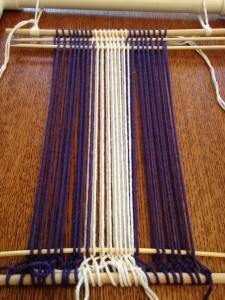 Repeat with another piece of yarn for the bottom dowel. 11. You can leave it like this, or you can make your sprang into a pouch! 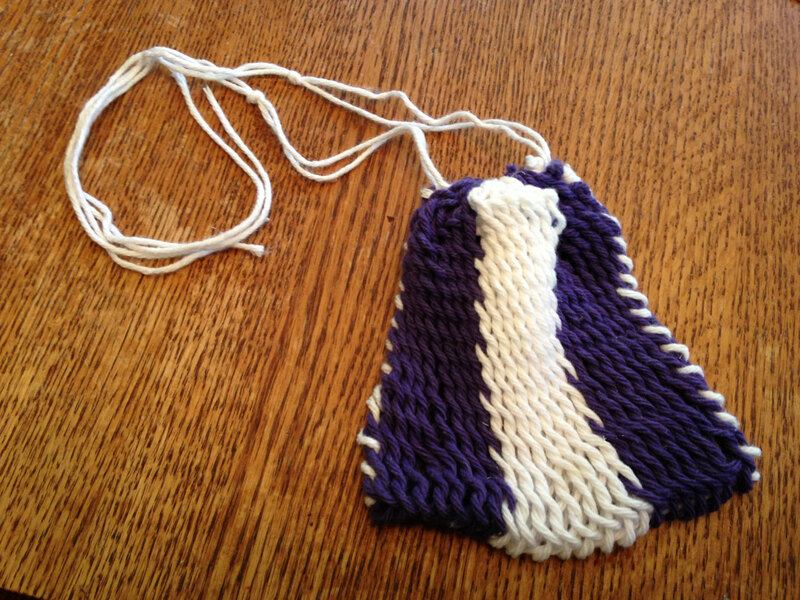 To make a pouch, fold your piece in half in the middle (where you inserted that yarn in step 8), thread a large-eye needle with one end of the middle thread, and begin stitching up the sides through the loops on the ends. 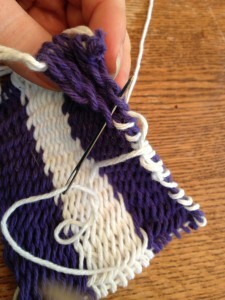 When you get to the top of the side, take several more stitches in the same spot then knot it securely. Repeat for the other side. 11a. 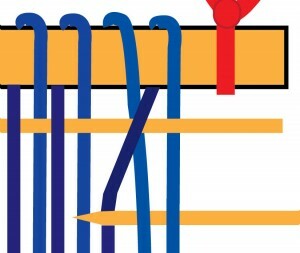 To turn the top strings into a drawstring, switch one of your top-loop strings so it enters/exits from the opposite side of the other string. This enables you to pull on both and tightly cinch the top. Tada! 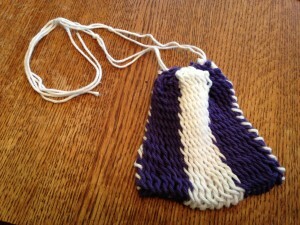 A beginner sprang pouch! Many thanks to Eva for teaching me how to do this. If you would like to learn more about sprang, check out Eva’s Advanced Sprang Techniques page. Eva also recommends the Sprang email list at Sprang-subscribe@yahoogroups.com, which includes several useful files including a copy of a Sprang Chronology started in Collingwood but added to by Maedb ingen Dungaile (also found here http://www.florilegium.org/?http%3A//www.florilegium.org/files/TEXTILES/sprang-chrono-art.html), and a very thorough bibliography (also found here http://www.cs.vassar.edu/~capriest/sprangbib.html). THL Eva is a student of Mistress Gytha Arnarsdottir (also known as Catherine of Chester) and resides in the Canton of Rimsholt. You can reach her through her web site at http://evavano.dreamwidth.org/. 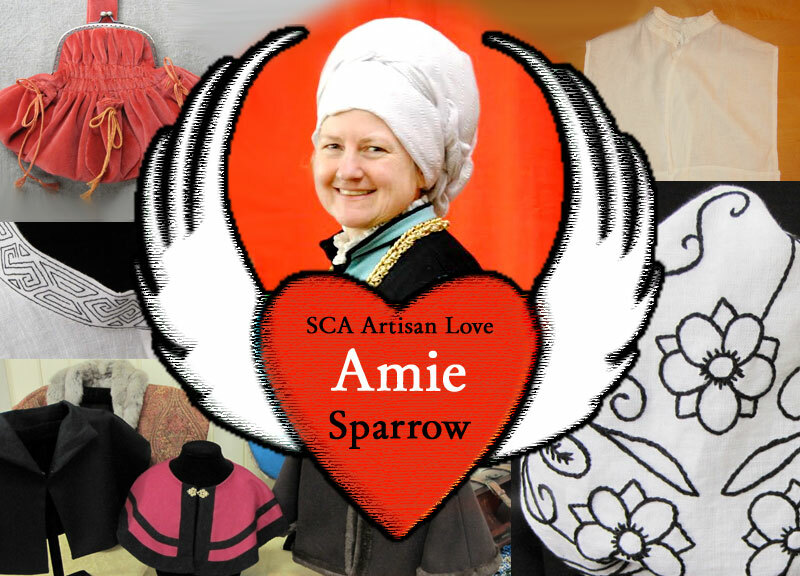 Please help share the love for A&S and the artisans who create it by sharing this post with your friends! And if you know of an artisan that deserves to be called out, please post here and spread the word-fame! 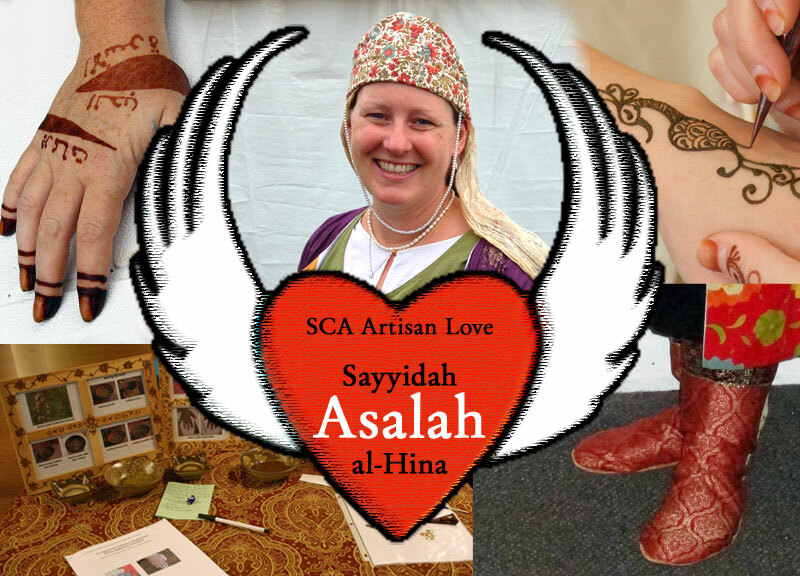 THL Sayyida Halima bint al-Rabi’i, or “Halima” as she is known by most, is the very first artisan I noticed as a newcomer to the SCA. Her work was on display at my first event, and I remember staring at it for a while trying to work out how on earth it was created. It mesmerized and confused and inspired me. What I now know is Halima is a felt artist who makes incredible works of art from wool. 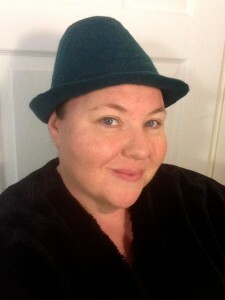 So when Halima offered a felting hat class, I eagerly signed up to learn more. 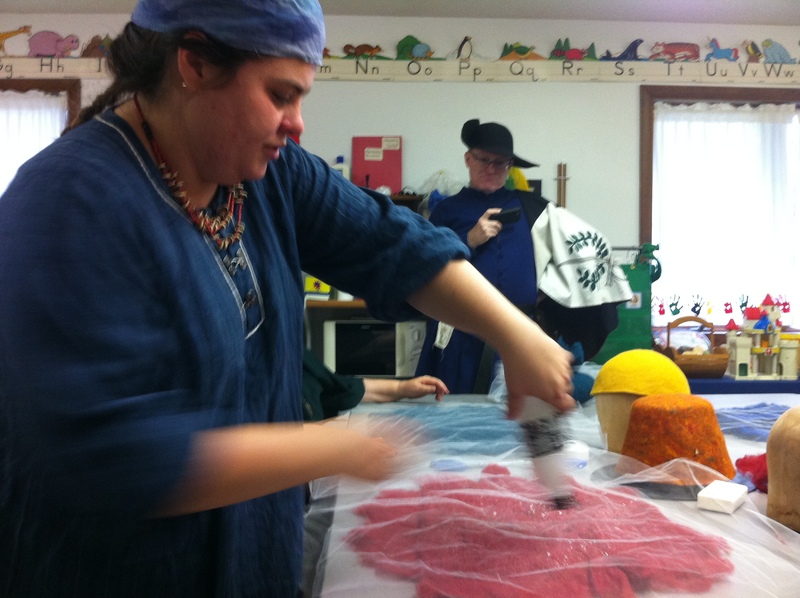 During the class I molded the fibers into a complete hat … and it was amazing! 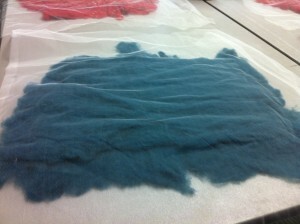 Here’s a quick summary of what Halima taught us that day for those curious how this felting thing actually works! 1. 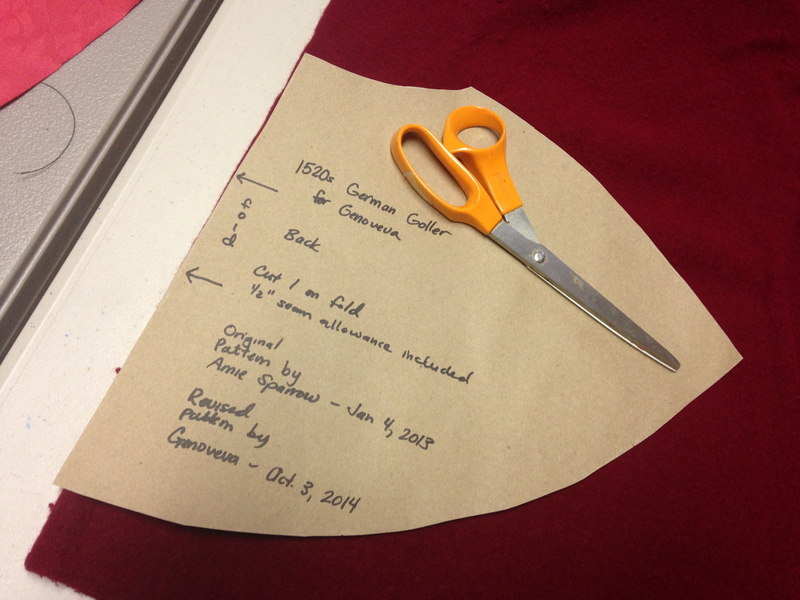 Cut out a resist (from cardboard in this case) slightly larger than the desired hat size. 2. 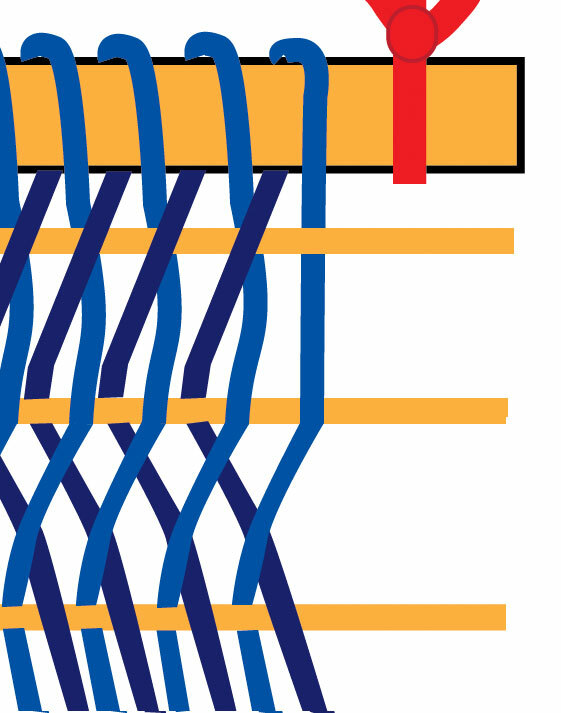 Lay two layers of wool fibers over the resist in alternating directions (one going up/down, one going side-to-side). Allow the wool to extend a bit beyond the resist. 3. Sprinkle/spray the wool with warm soapy water. 4. 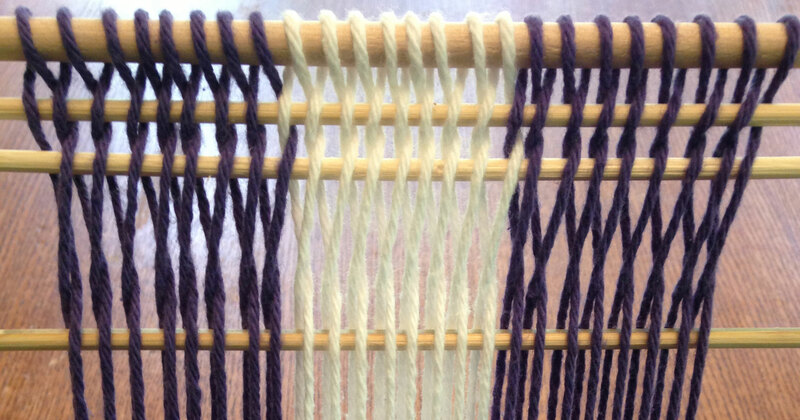 Lay a fabric netting over the wool and gently press it down to distribute the water and condense the wool. 5. 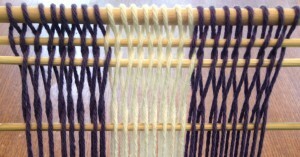 Flip it all over (wool, resist, netting) and pull the wool around the edges. 7. Keep the wool thoroughly wet, but not too wet, and rub the wool on all sides in a circular motion to “felt” the wool. Keep the fabric netting on top of the wool to keep the wool in place and avoid having the wool stick to your hands. 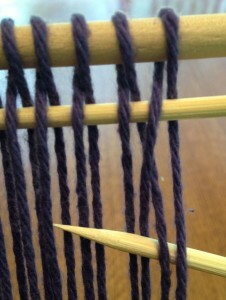 Rub the wool until it has felted to the point where it will not pull apart when pinched. This took a while! 8. Cut open the bottom of the felted wool and pull out the resist. 10. 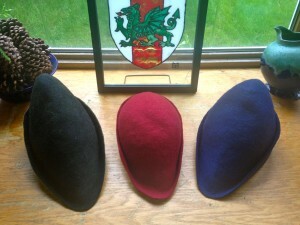 Place the hat on the hat block or a person’s head, then stretch over to smooth and mold into the shape desired. 11. Rinse the soap out of the hat, trim the edges, and allow to dry. This was a just a quick description of what I learned from Halima — I recommend you take one of Halima’s classes to get your hands wet and soapy and felt something yourself! 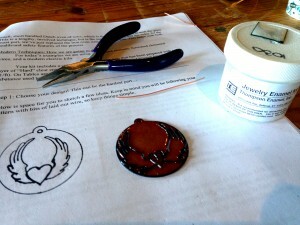 Check Halima’s web site at http://www.wanderingsheep.com/ for upcoming classes! 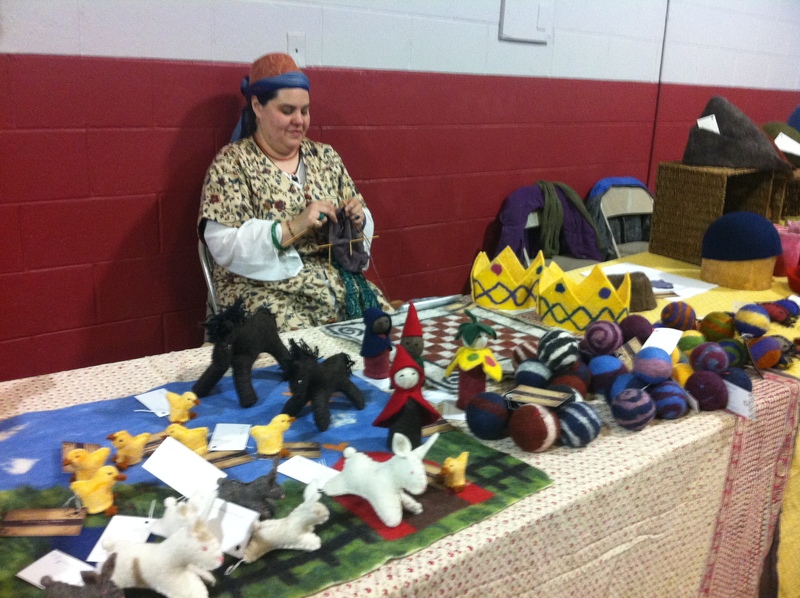 Halima also takes commissions and sells her creations in her Etsy shop and at at SCA events (I believe she’ll be at Border War). 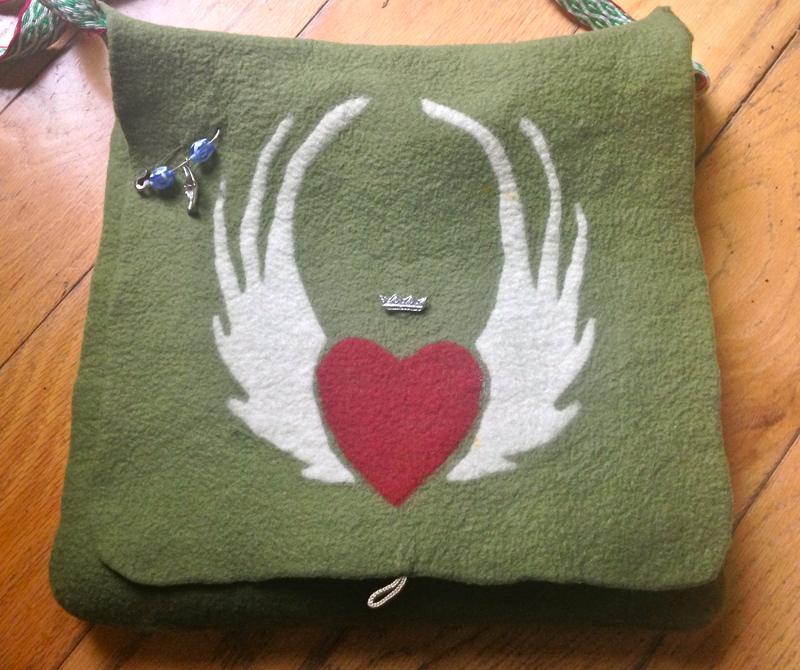 Here’s the beautiful bag I commissioned from her — I intended it to be a bag to hold a first-aid kit, but now I just use it for my all-purpose bag. I’ve been using it for two years now and look how lovely it remains! It holds its shape remarkably well. 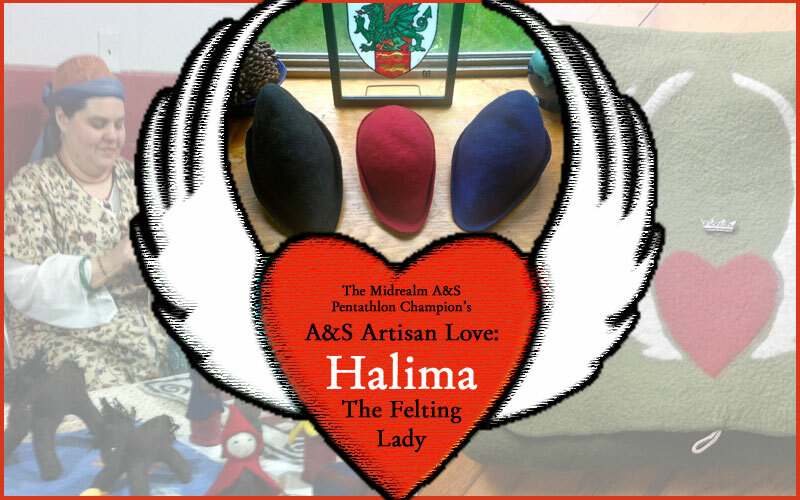 Halima’s SCA A&S achievements include the Order of the Willow and Order of the Evergreen, as well as being selected as Cynnabar’s Baronial A&S Champion in 2010. 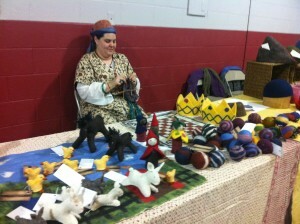 Halima was the founder and event steward of Fiber Faire and Fiber Faire 2, which focused on the fiber arts! Halima also enters her creations at the Midrealm A&S competitions, one of which I recently had the opportunity to transport for her. Here is her 2014 A&S entry — three delightful bycocket hats! 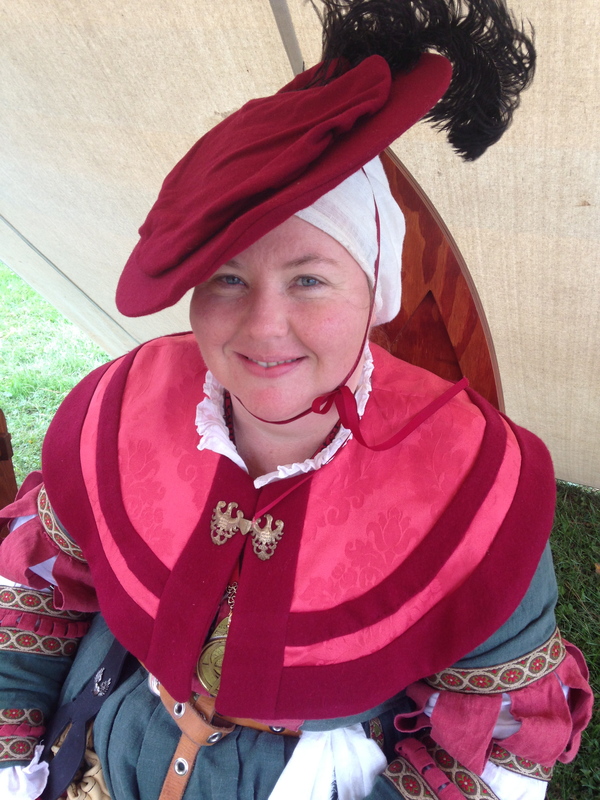 THL Halima is a student of Master Henry Kersey of Devon and resides in the Barony of Cynnabar. You can reach her through her web site at http://www.wanderingsheep.com. Please help share the love for A&S and the artisans who create it by sharing this post with your friends! 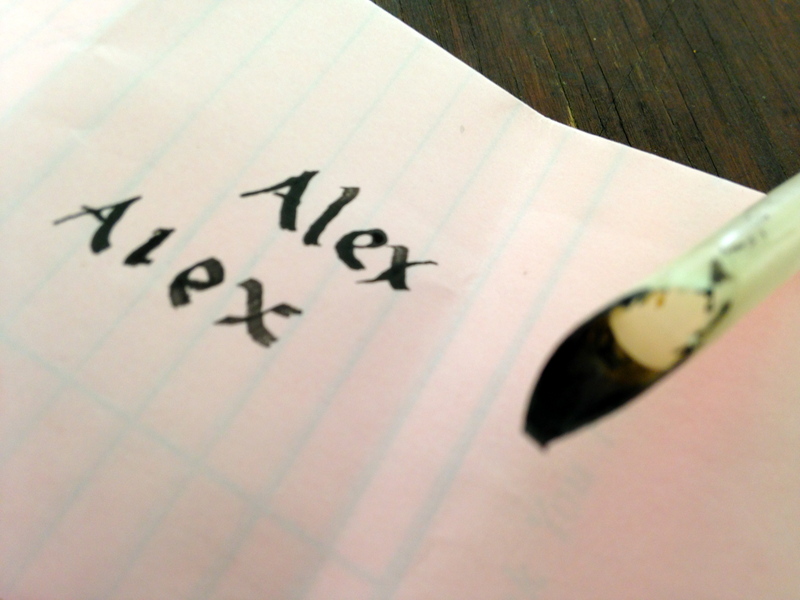 And if you know of an artisan that deserves to be called out, please reply here and spread the word-fame!